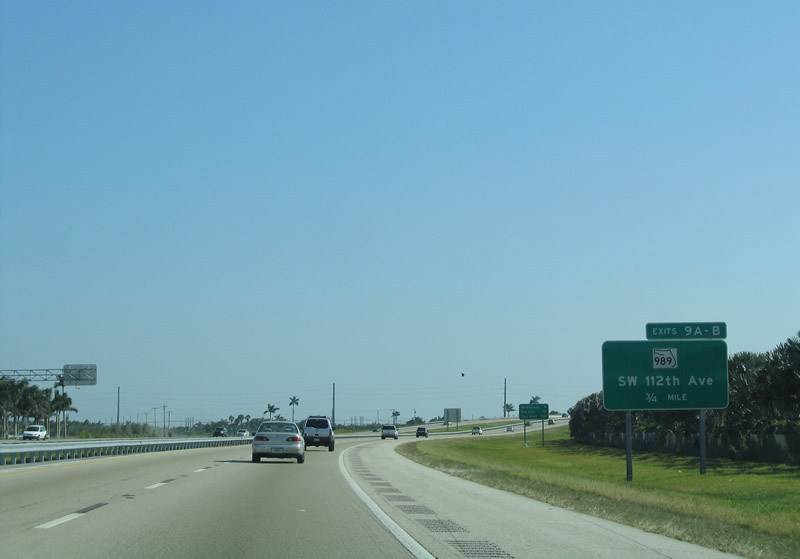 Immediately after the split in the turnpike, the southbound Florida 821/Homestead Extension of Florida's Turnpike reaches Exit 47, Florida 817 south, N.W. 27th Avenue and Florida 817 north, University Drive. 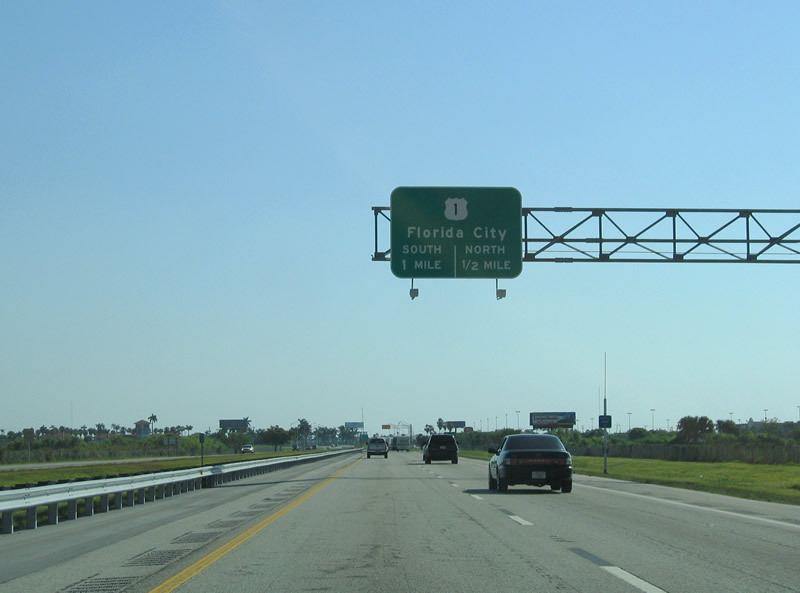 Florida 817 changes names due to its proximity to the Miami-Dade County/Broward County Line. However, for now, the turnpike remains in Broward County as it angles west rather than due south. Photo taken 12/28/03. Beyond the Exit 47 off-ramp is the Lake Lucerne main line Toll Plaza. 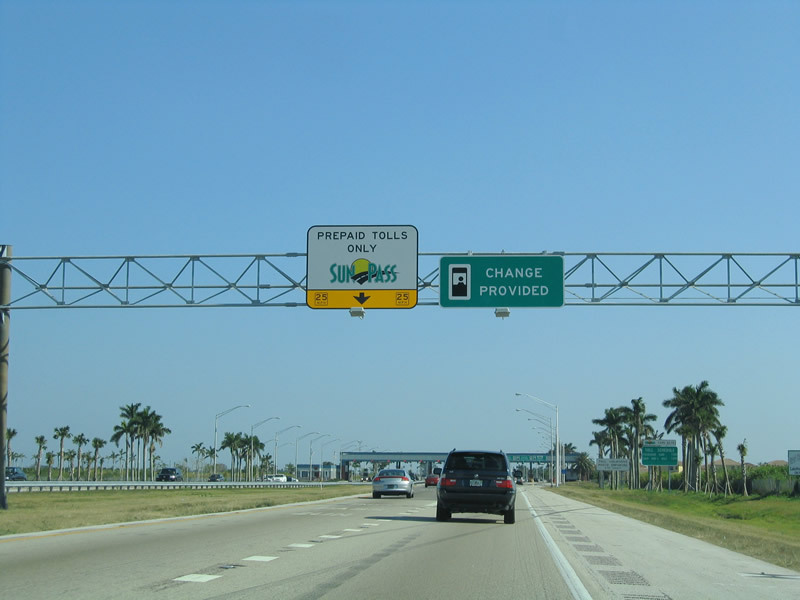 The toll barrier is split between the southbound mainline and on-ramp from Florida's Turnpike northbound from Dolphin Stadium and Miami. 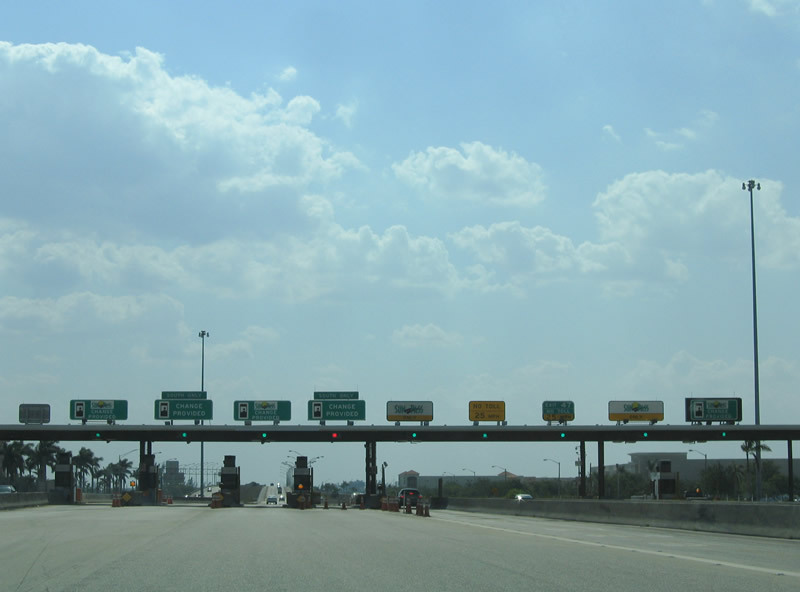 Travelers departing via Exit 47 are not charged a toll. Photo taken 05/06/06. Florida's Turnpike continues west to Florida 823 (Northwest 57th Avenue / Red Road) at Miramar. 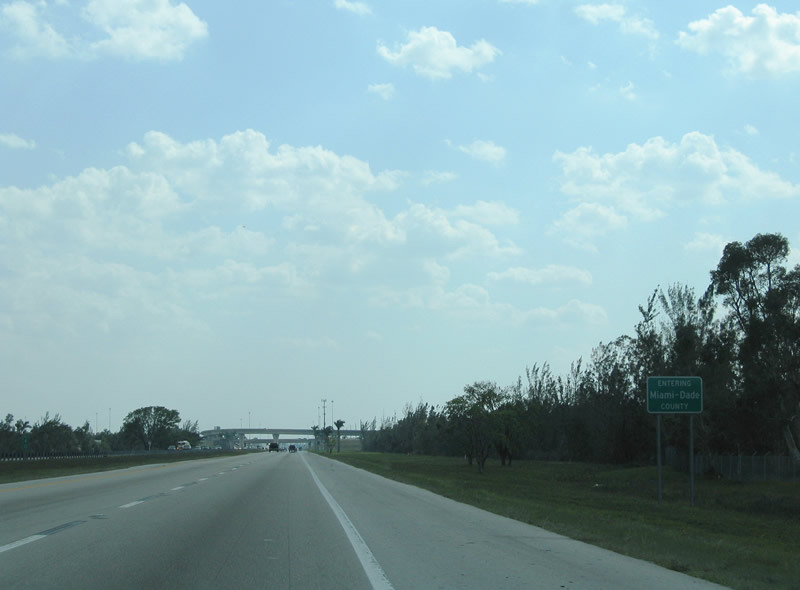 The Turnpike parallels the Miami-Dade County line between Lake Lucerne and Exit 42. 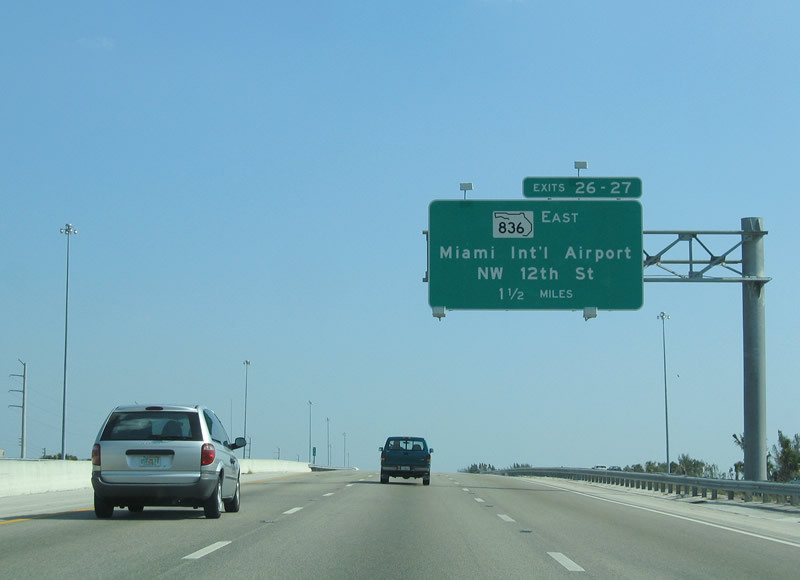 Florida 823 travels north from Miami Lakes into Miramar at the Turnpike. Photo taken 05/06/06. 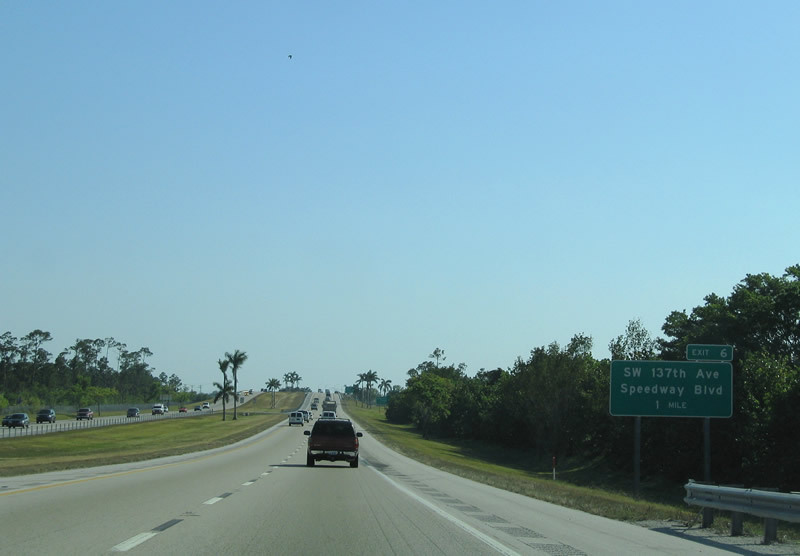 Southbound Florida's Turnpike reaches Exit 43, Florida 823, Red Road/N.W. 57th Avenue. Florida 823 continues north along Red Road to Florida 858 (Miramar Parkway) and Flamingo Road into Pembroke Pines. The sign bridge assembly pictured in 2003 was topped by winds of Hurricane Wilma in 2005. Photos taken 12/28/03 & 05/06/06. 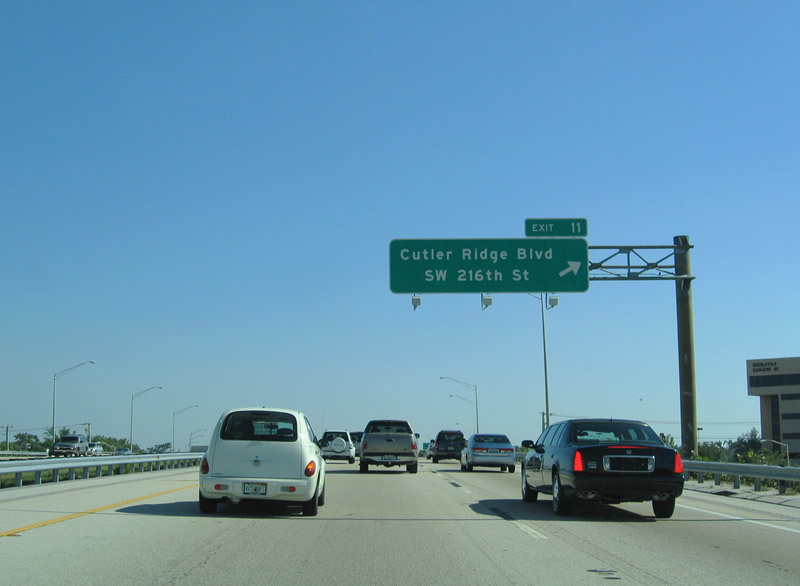 Curving southwest, Turnpike drivers enter Miami-Dade County and exit Miramar and Broward County. Photo taken 05/06/06. 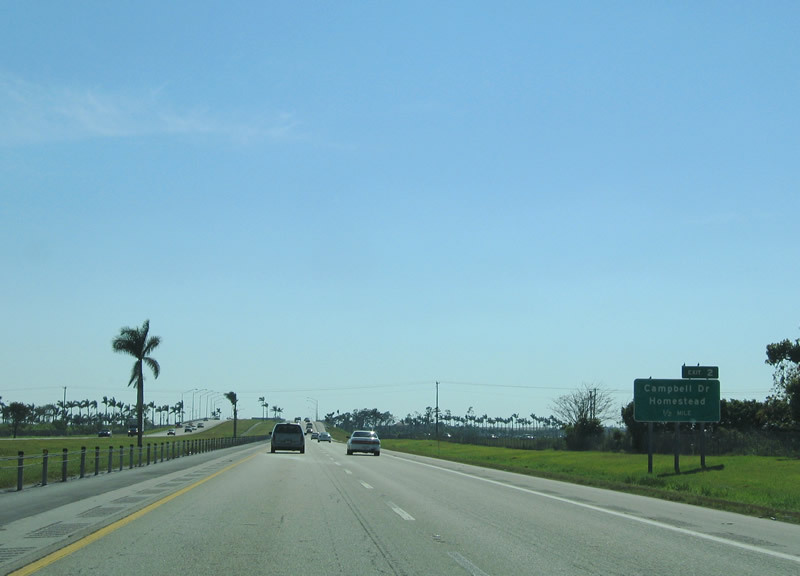 A wye interchange (Exit 39 on northbound) joins Florida's Turnpike with Interstate 75 near Palm Springs North. There is no access to Interstate 75 north or south from the Turnpike south. 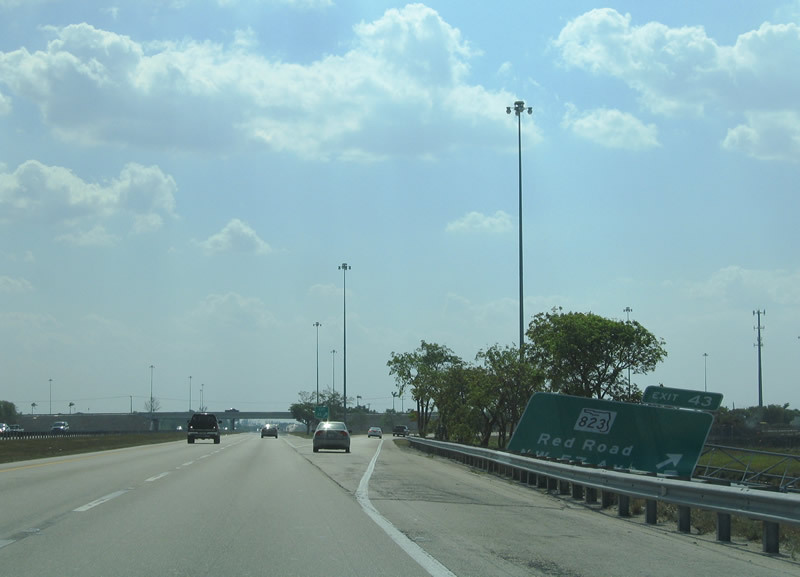 A ramp however does connect Interstate 75 south with the Turnpike south, expanding the toll road from four to six lanes, and thus incorporating a left-lane truck restriction southward for 20 miles. Photo taken 05/06/06. The Interstate 75 mainline passes overhead en route to Miramar and Hialeah. 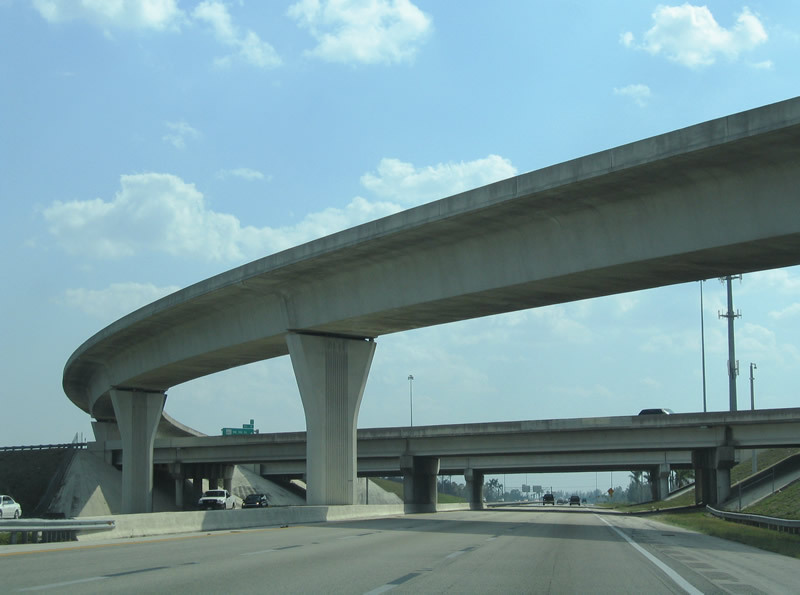 The tall flyover carries Exit 39 traffic onto Interstate 75 north from Florida's Turnpike north. Photo taken 05/06/06. 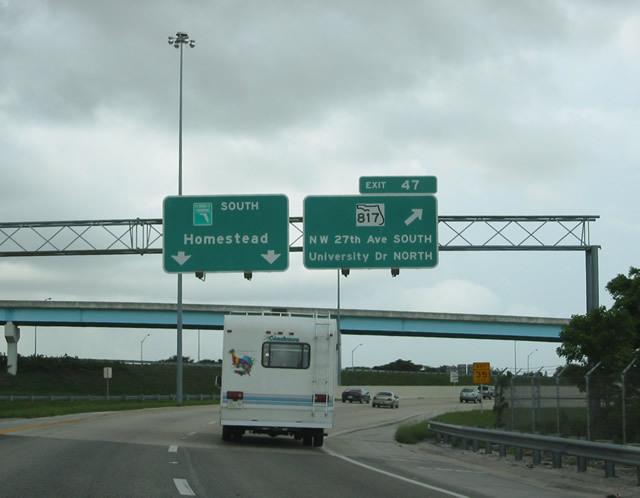 Mileage sign posted after the merge with traffic from Interstate 75 highlighting the distances to Homestead and Key West (via U.S. 1 south from Florida City). Photo taken 05/06/06. U.S. 27 is a major north-south corridor, connecting South Florida with Central Florida and the state capital of Tallahassee in the Florida Panhandle. 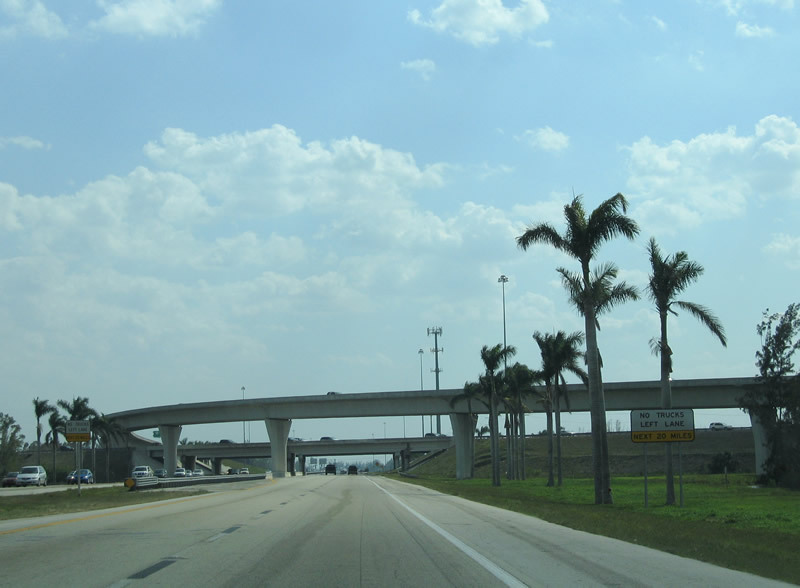 The U.S. highway parallels the Miami Canal along Okeechobee Road and meets Florida's Turnpike at Exit 35. Photo taken 05/06/06. One mile south of the Exit 35 folded-diamond interchange with U.S. 27 at Pennsuco. 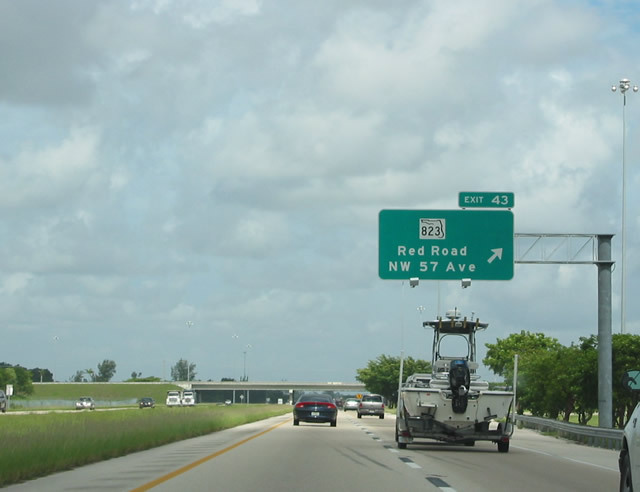 To the north, U.S. 27 follows the Miami Canal, which connects Lake Okeechobee with Biscayne Bay via a continuous canal that crosses miles of Everglades Swamp. Photo taken 05/06/06. 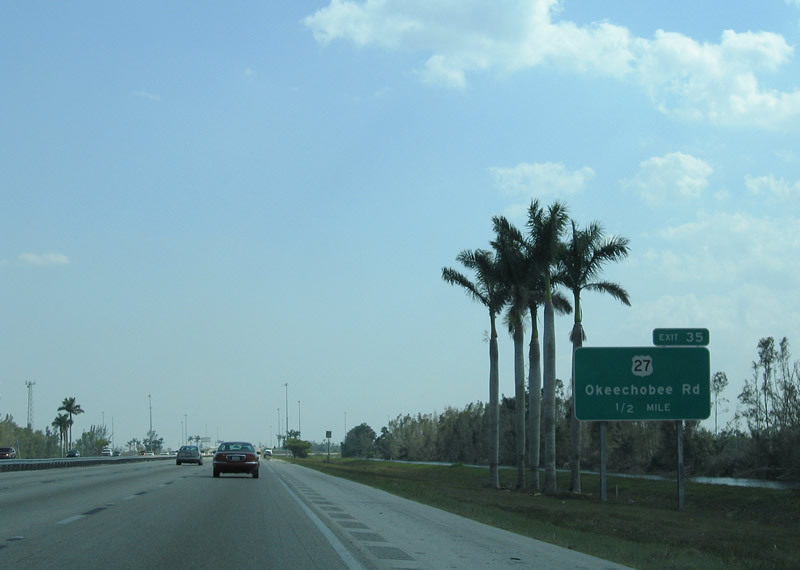 U.S. 27 (Okeechobee Road) continues south from Exit 35 into Hialeah Gardens, Medley, and Hialeah on the drive toward Miami. Photo taken 05/06/06. 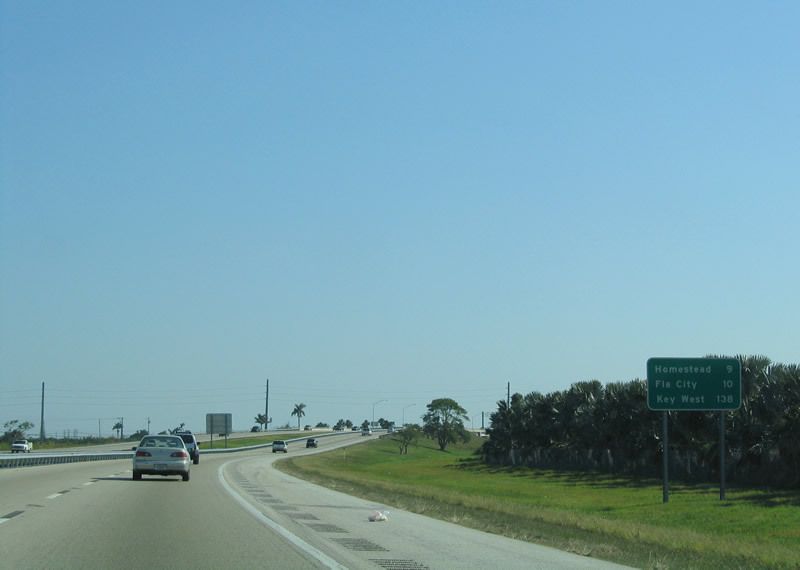 Exit 35 leaves Florida's Turnpike southbound for U.S. 27 (Okeechobee). 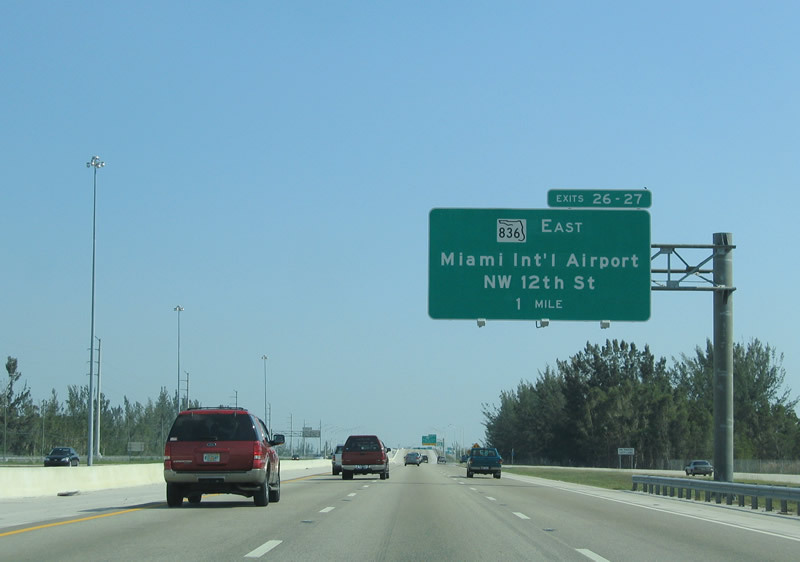 U.S. 27 (Florida 25) ends at U.S. 1 north of downtown Miami to the south. 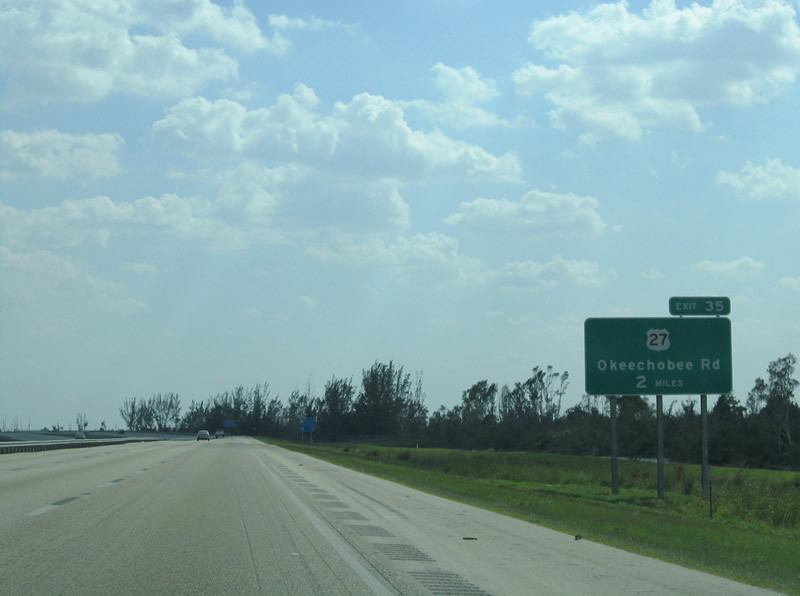 The U.S. highway joins South Florida with South Bay and Clewiston at Lake Okeechobee to the north. Photo taken 05/06/06. The next exit along southbound is Exit 34, N.W. 106th Street east to U.S. 27 and Hialeah Gardens. Photo taken 12/28/03. All signs for Exit 34 (Northwest 106th Street) were blown down by 2005's Hurricane Katrina. A trumpet interchange otherwise facilitates movements to Northwest 106th Street (Gran Park) east to Medley. Photo taken 05/06/06. 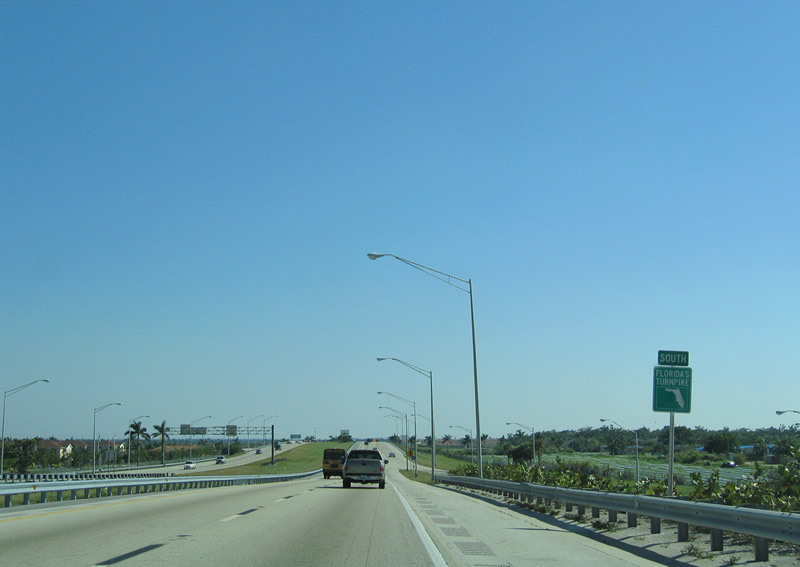 Florida's Turnpike enters a rural stretch (at least to the west) on the five-mile approach to Florida 836 (Dolphin Expressway). 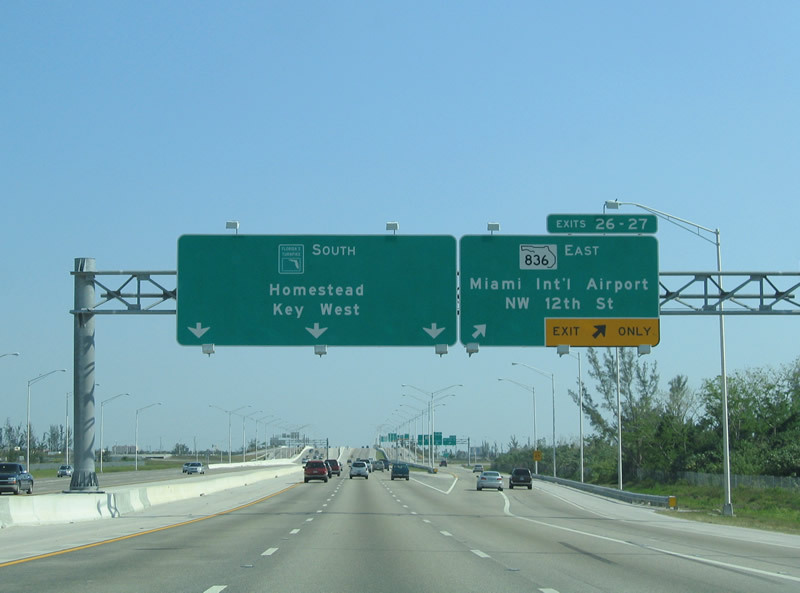 Homestead and Key West join the road to Miami International Airport (MIA) on this mileage sign posted south of Exit 34. Photo taken 05/06/06. 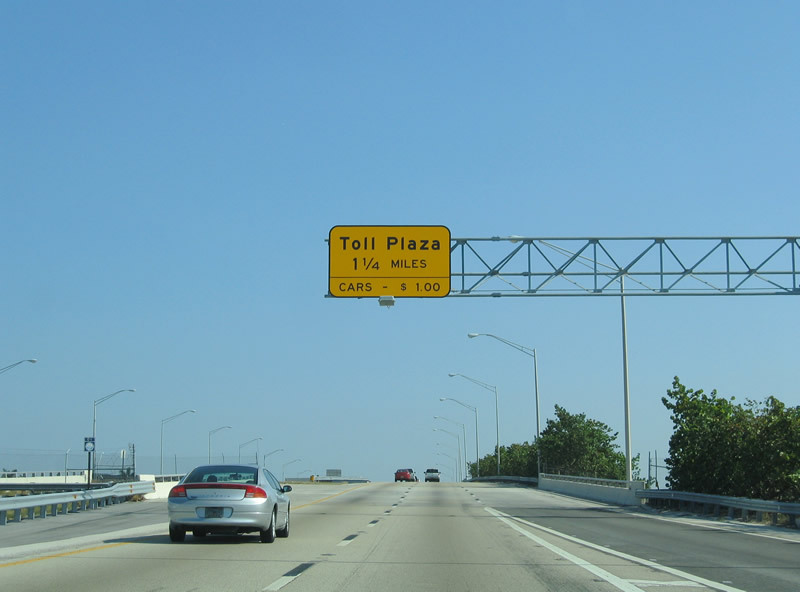 Approaching the Doral area main line toll plaza on Florida's Turnpike south. 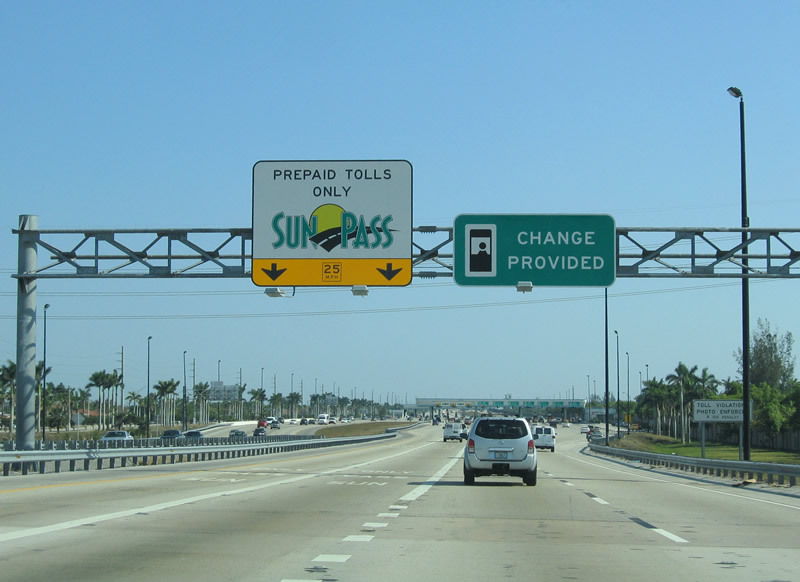 All motorists are charged $1.00 or 75 cents depending upon method of payment (SunPass account holders are offered a discount). Photo taken 05/06/06. 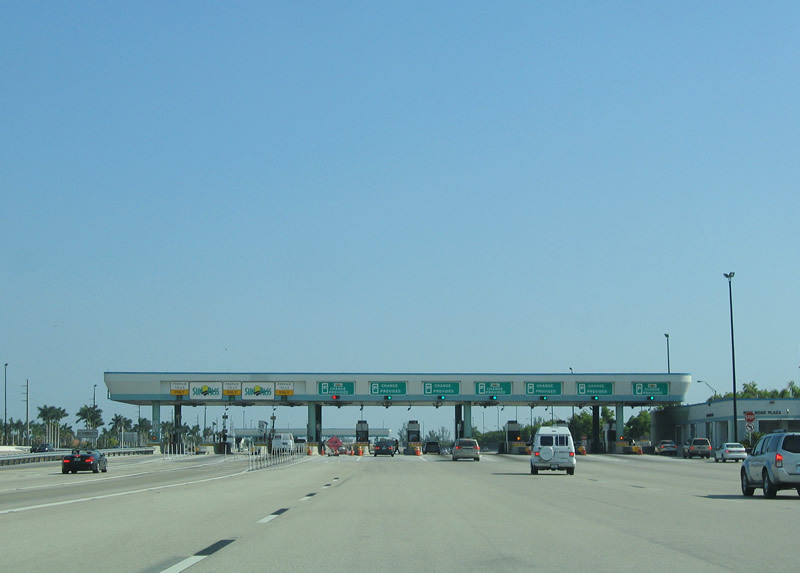 Two SunPass only lanes line the inside lanes of the main line toll plaza. These lanes however are not open road tolling based as traffic still must slow to 25 mph through the plaza. Photo taken 05/06/06. Toll schedule sign posted ahead of the Dora area toll plaza on Florida's Turnpike south. Photos taken 05/06/06. There is no direct access to Northwest 58th Street at the community of Doral east of Florida's Turnpike. Instead motorists' next departure point lies at Exit 29 with Northwest 41st Street. Photo taken 05/06/06. 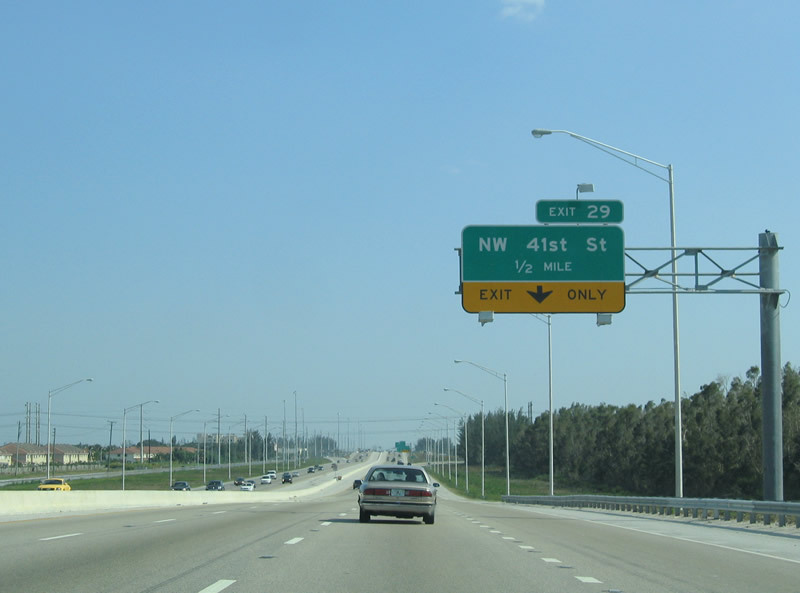 Northwest 41st Street consists of a divided highway leading east from Exit 29 to Doral Boulevard / Northwest 36th Street in Doral. Florida 948 follows Northwest 36th Street east from Galloway Road (NW 87th Avenue). Photo taken 05/06/06. 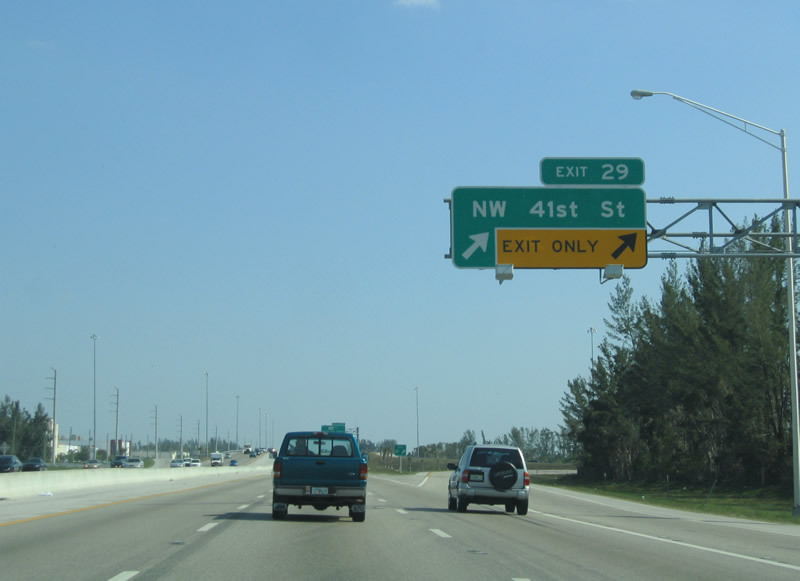 A fourth auxiliary lane continues south from the Doral area toll plaza as an exit only to the Exit 29 parclo interchange with Northwest 41st Street. Photo taken 05/06/06. 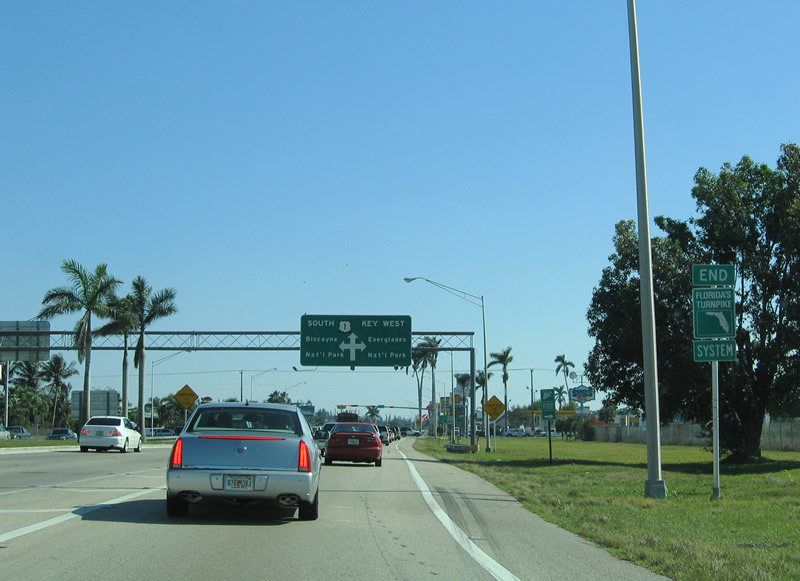 Exit 29 departs as a two-lane off-ramp to Northwest 41st Street from Florida's Turnpike south. Northwest 41st Street ends at a water treatment facility to the west; eastward NW 36th Street (Florida 948) continues to Virginia Gardens. Photo taken 05/06/06. A bit further south, southbound Florida's Turnpike approaches a major interchange with Florida 836, the Dolphin Expressway, a toll road operated by the Miami-Dade Expressway Authority (MDX). 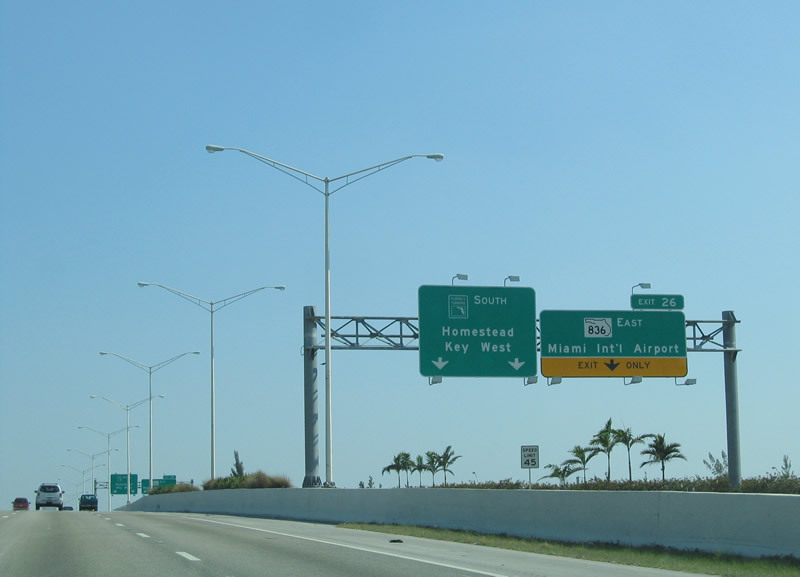 Use Florida 836 due east to Miami International Airport, downtown Miami, and Miami Beach (Via Interstate 395 and Florida A1A). Photo taken 05/06/06. 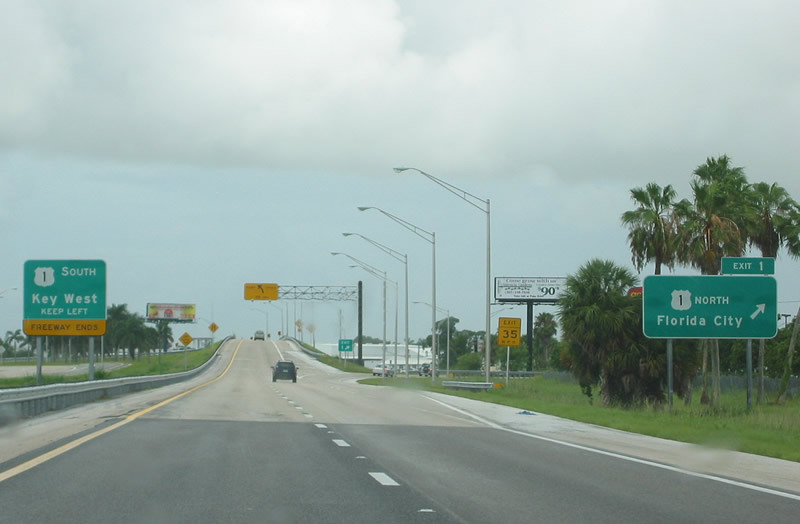 At one time, plans called for Florida 836 to become part of Interstate 75, but Interstate 75 was rerouted from U.S. 41 to the Alligator Alley (former Florida 84). 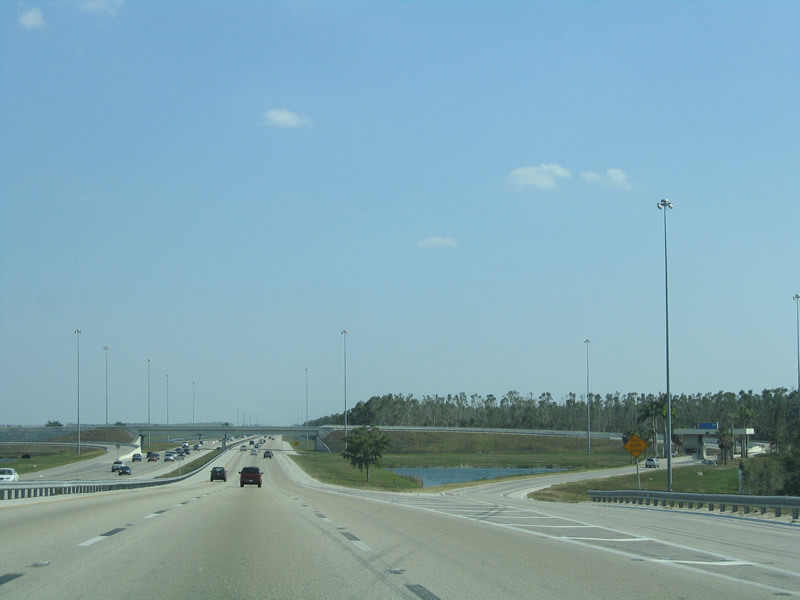 As a result, Florida 836 is simply a state road and not an Interstate highway. 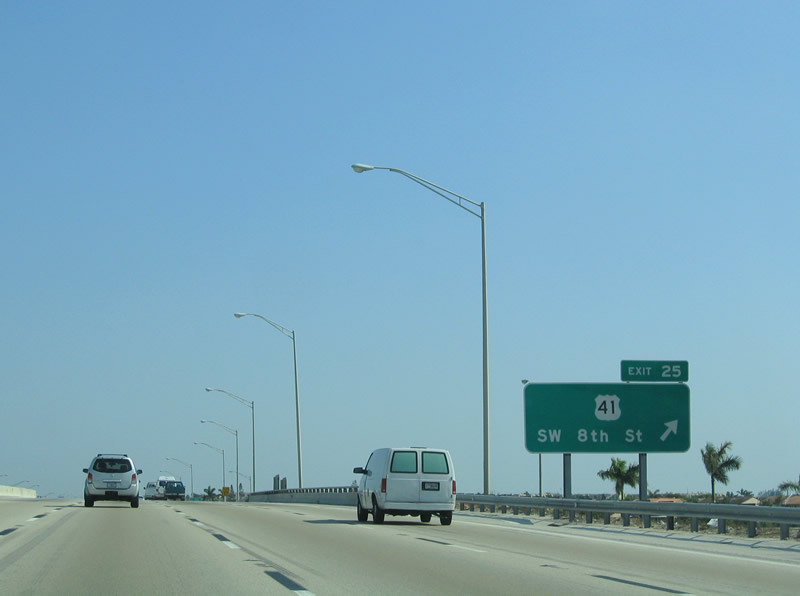 Nevertheless, Florida 836 functions as a major freeway, as it carries a great deal of traffic and is the only east-west freeway to connect the turnpike, Florida 826, and Interstate 95 together. Photo taken 05/06/06. 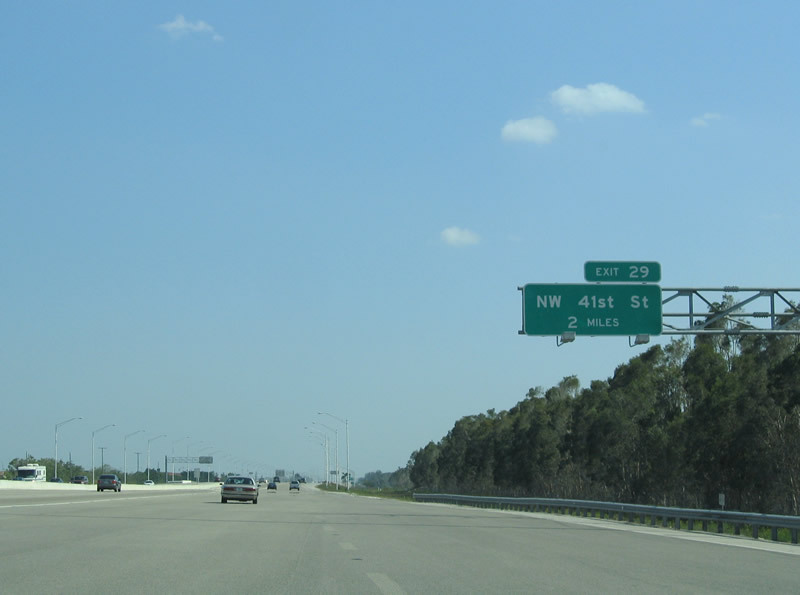 A collector-distributor roadway carries drivers both to Exit 27 (Northwest 12th Street) and Exit 26 (Florida 836 east). There is no access to the 2007-completed Dolphin Expressway westbound extension. 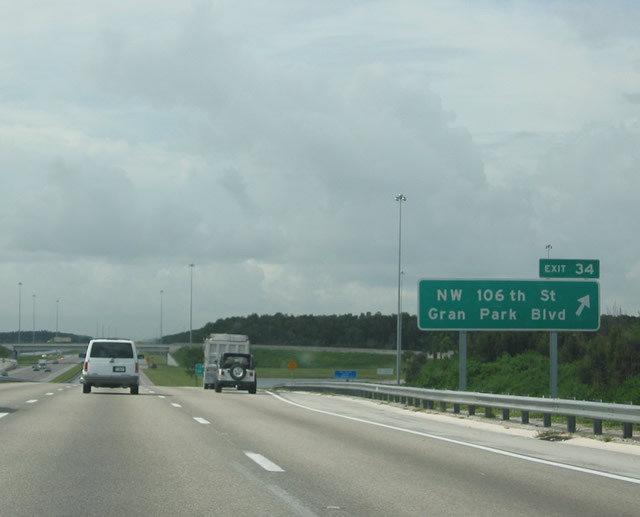 With the lengthening, Florida 836 grew two miles in length between Florida's Turnpike and Northwest 137th Avenue north of U.S. 41 (Tamiami Trail). Photo taken 05/06/06. Florida 836 (Dolphin Expressway) provides a direct route to Downtown Miami via its connections with Interstates 95 and 395 northwest of the central business district. Photo taken 05/06/06. 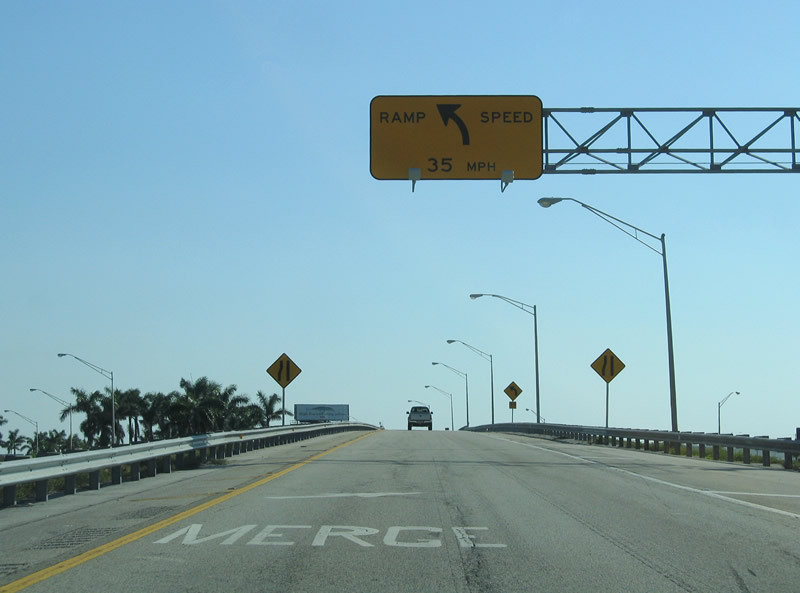 A two-lane c/d roadway departs for Northwest 12th Street (folded diamond interchange) and Florida 836 (Dolphin Expressway) east (via a loop ramp). Northwest 12th Street parallels the Dolphin Expressway west to Northwest 137th Avenue and east to the Dolphin and Miami International Malls. Photo taken 05/06/06. Exit 27 leaves the adjacent c/d roadway for Northwest 12th Street. Northwest 12th Street connects with Florida 985 (Northwest 107th Avenue) nearby. Photo taken 05/06/06. Nearing the Exit 26 ramp onto Florida 836 (Dolphin Expressway) eastbound. 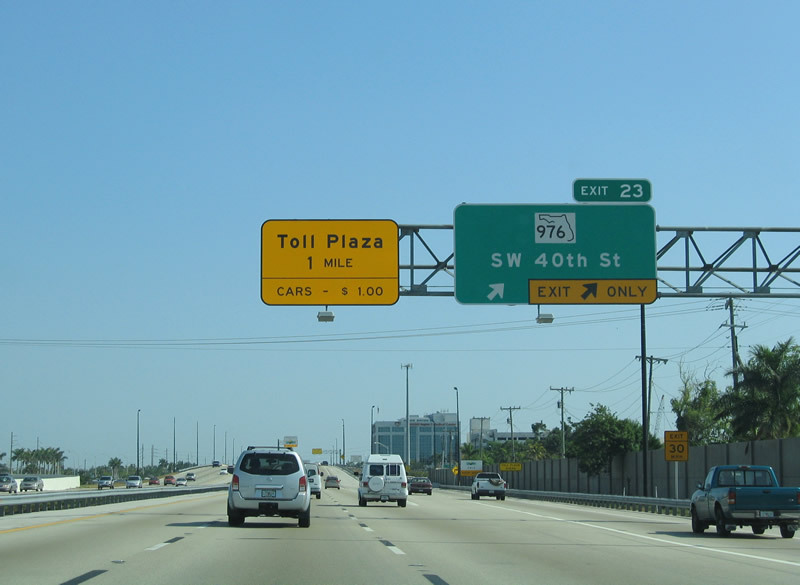 Florida 836 eventually becomes a toll road, but between Florida's turnpike and Miami International Airport (MIA), the road is free. Photo taken 05/06/06. Exit 26 departs Florida's Turnpike ahead of the c/d roadway return onto southbound. 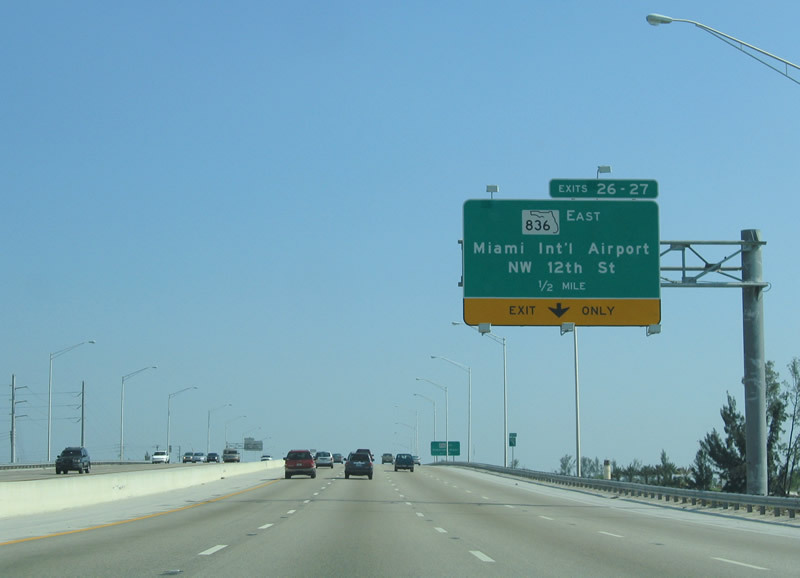 Florida 836 directly connects with Interstate 395 east to Florida A1A (MacArthur Causeway) east to Miami Beach. Photo taken 05/06/06. 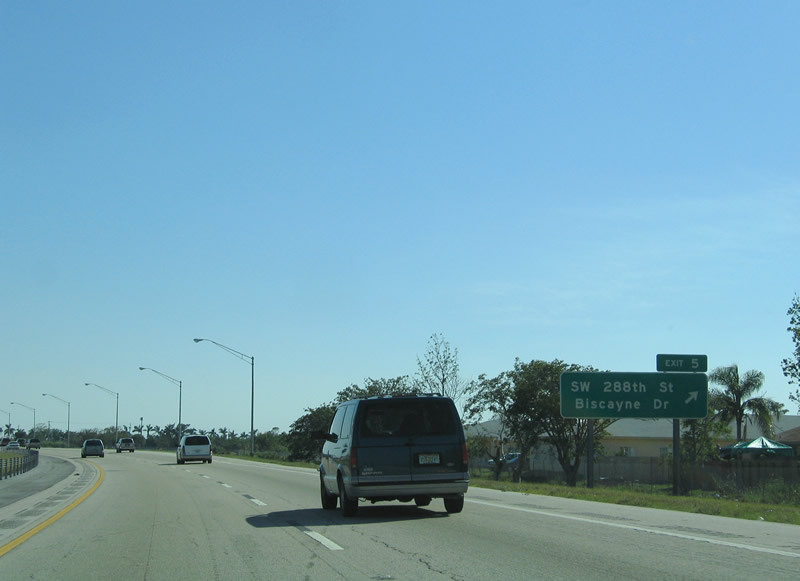 The next exit along southbound is Exit 25, Junction U.S. 41/Tamiami Trail. 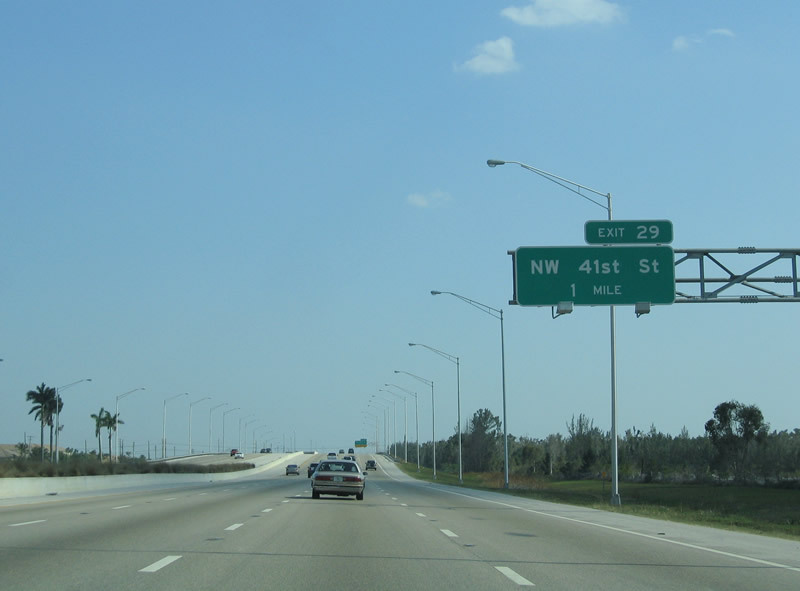 U.S. 41 travels east into downtown Miami via Little Havana; it heads northwest from this interchange across the Everglades to the Gulf Coast, where it connects to Marco Island, Naples, and Fort Myers. Photo taken 12/28/03. 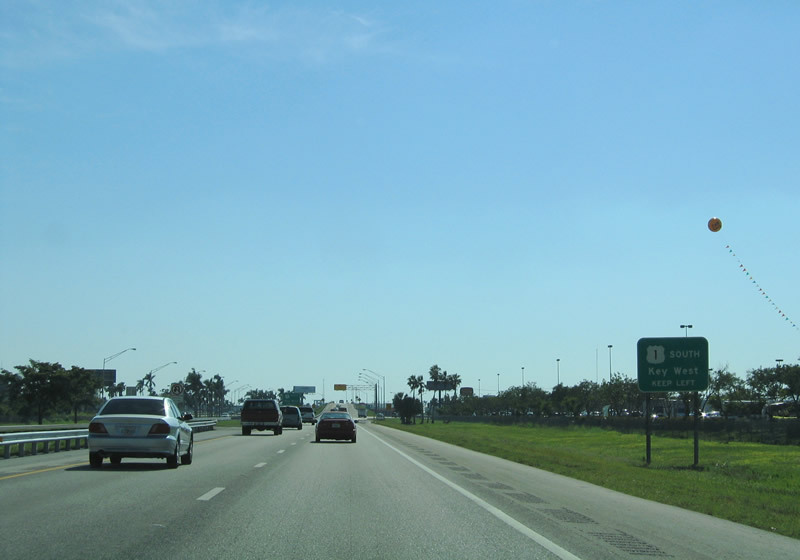 Florida's Turnpike southbound at the Exit 25 folded-diamond interchange with U.S. 41 (Southwest 8th Street). Situated east of Exit 25 via U.S. 41 is the City of Sweetwater, Florida International University, Tamiami Park, and the Miami-Dade County Fair & Exposition. 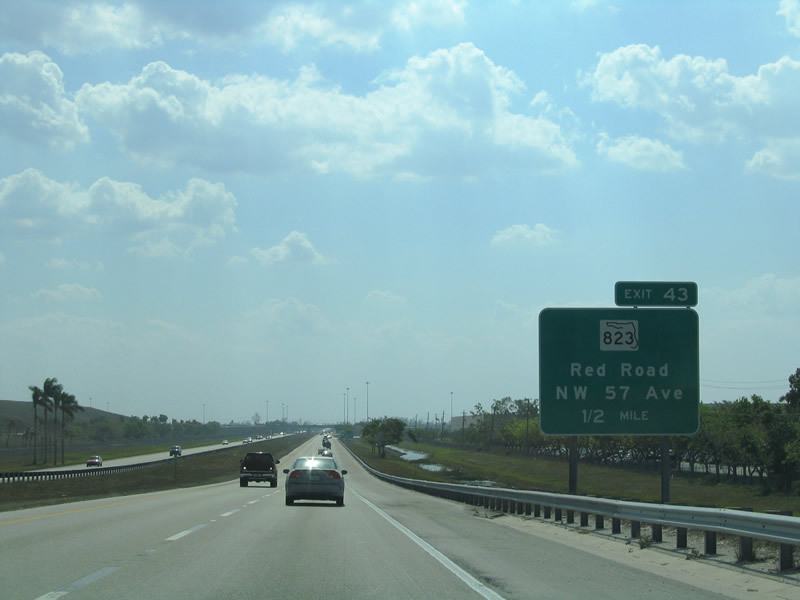 U.S. 41 west travels 95 miles to Naples. Photo taken 05/06/06. 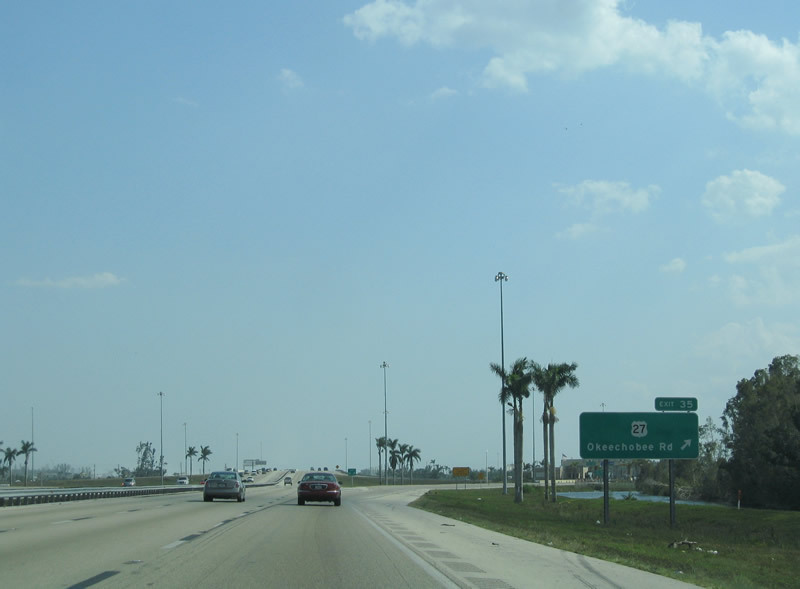 The next exit along southbound Florida's Turnpike is Exit 23, Florida 976, S.W. 40th Street (Bird Road), one mile. Photo taken 12/28/03. Florida 976 follows Bird Road (S.W. 40th Street) east to Westwood Lakes, Olympia Heights, South Miami, and Coral Gables, connecting to U.S. 1/Dixie Highway in Miami. Photo taken 12/28/03. 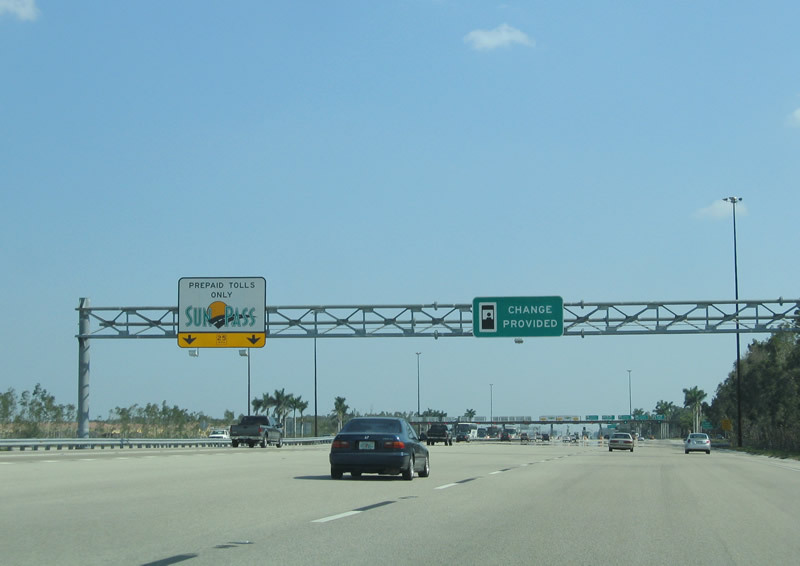 Southbound Florida's Turnpike reaches the Exit 23 parclo interchange with Florida 976 (Bird Road). Bird Road / Southwest 42nd Street continues west to the Kendale Lakes community, ending at Florida 997 (Krome Avenue) in the Everglades. Photo taken 05/06/06. 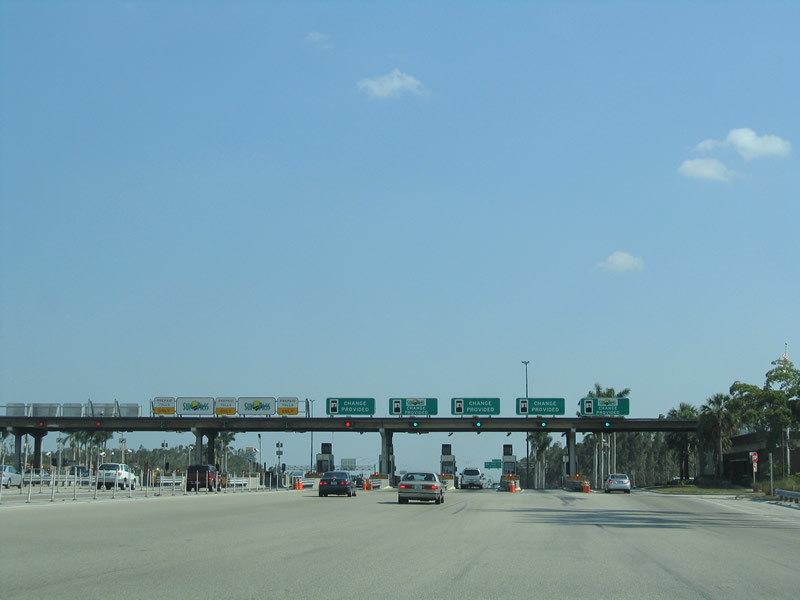 Drivers next encounter the Westwood Lakes main line Toll Plaza on Florida's Turnpike south. Toll booths are situated in both directions, but staggered, not directly across, from one another Photo taken 05/06/06. 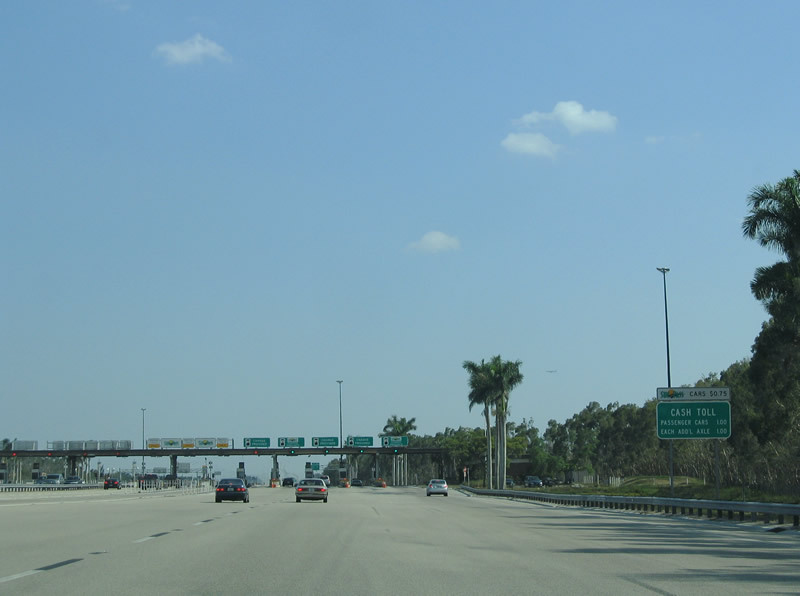 A pair of left-hand SunPass only lanes segregate from the right-hand cash lanes at the Westwood Lakes Toll Plaza. The lanes require drivers to slower to 25 mph while others must stop. Photo taken 12/28/03. 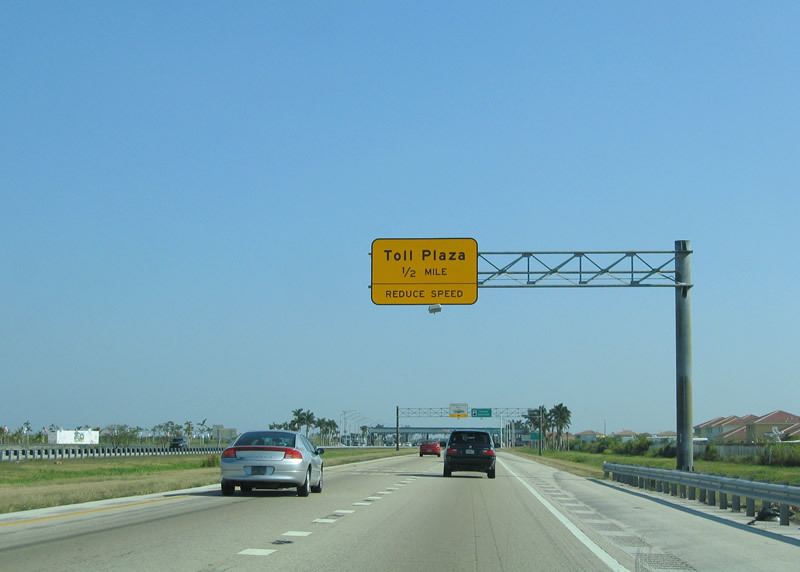 Entering the Westwood Lakes Toll Plaza on Florida's Turnpike southbound. Passenger vehicles are charged $1.00 for cash transactions and 75 cents for SunPass transactions. Photo taken 12/28/03. 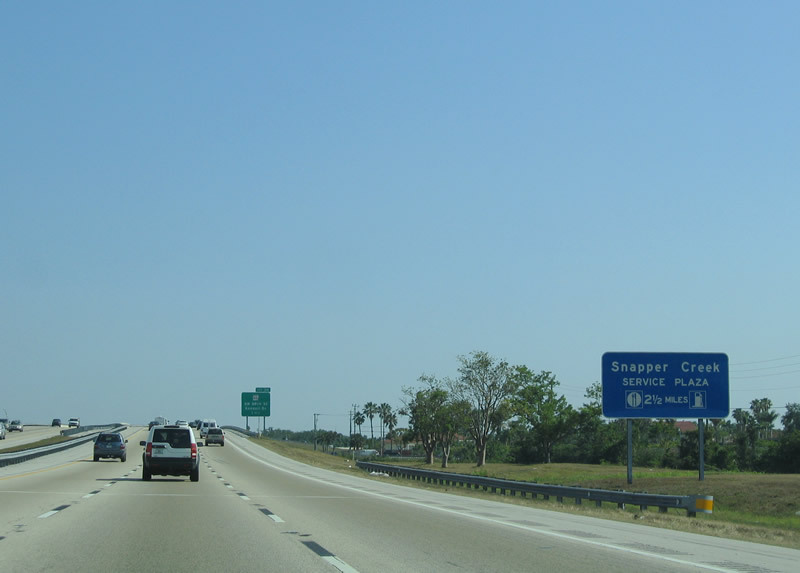 The Snapper Creek Service Area lies 2.5 miles south of Westwood Lakes beyond the Exit 20 six-ramp parclo interchange with Florida 94 (Southwest 88th Street). Photo taken 05/06/06. 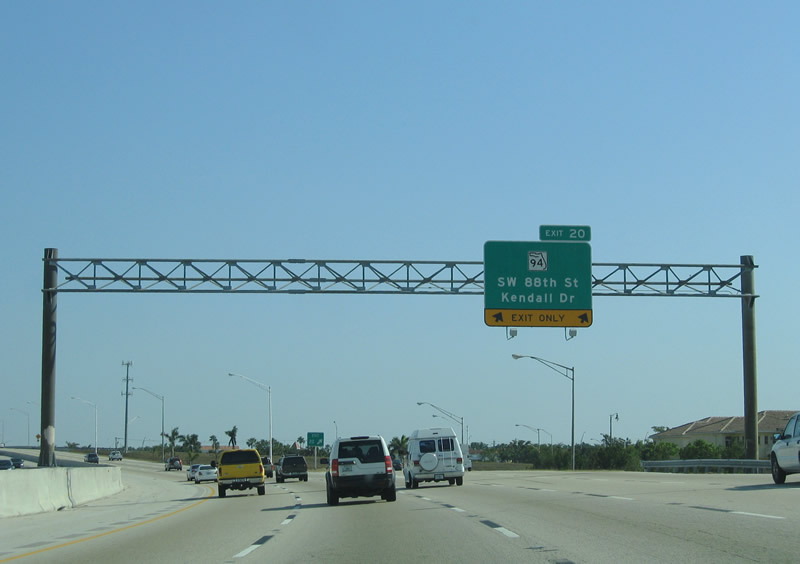 The next exit along southbound is Exit 20, Florida 94, Kendall Drive/S.W. 88th Street, one mile. Use Florida 94 east to Pinecrest and Kendall and west to Florida 997/Krome Avenue. Photo taken 05/06/06. 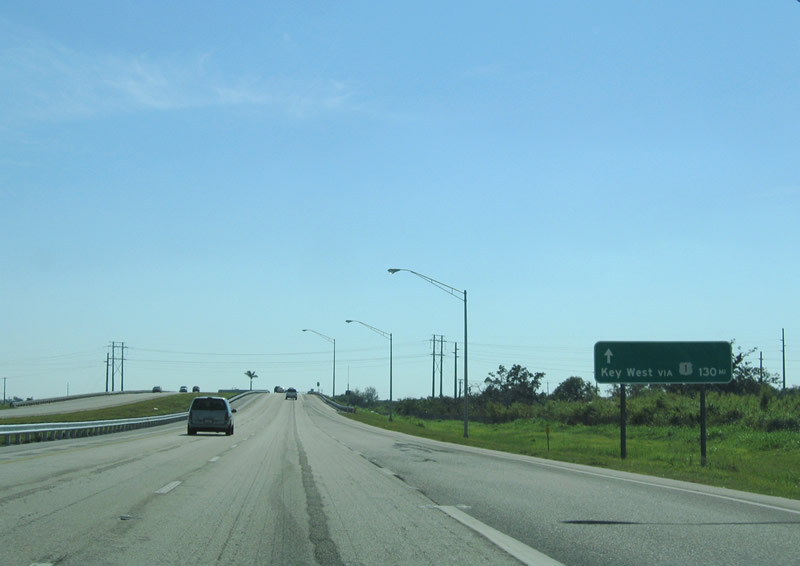 Florida 94 represents the highest east-west two-digit state road in the state. 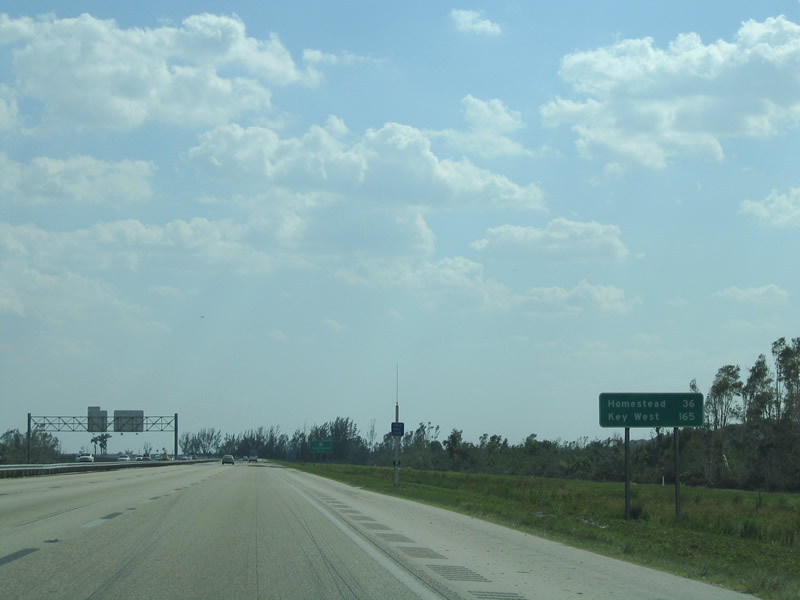 The state road travels east from Florida 997 (Krome Avenue) in the Everglades through Hammocks and Kendale Lakes to U.S. 1 (South Dixie Highway). Photo taken 05/06/06. 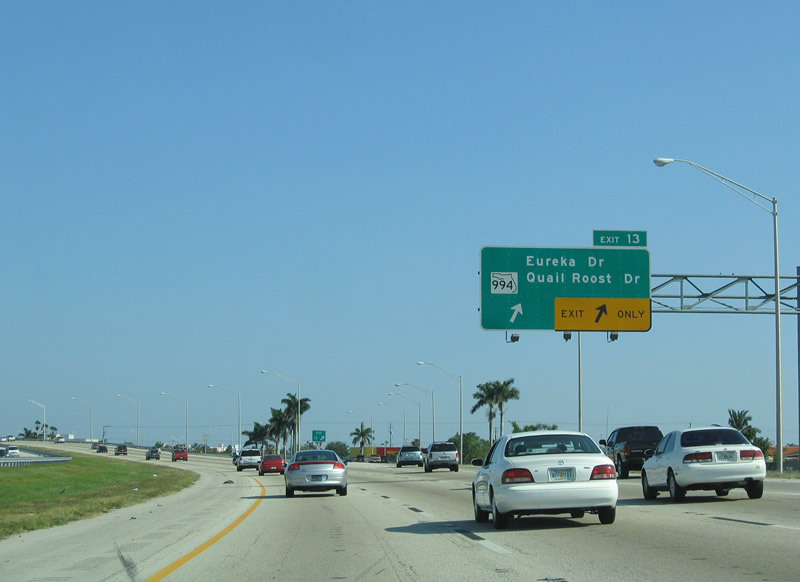 The right two lanes join onto Florida 94 (Kendall Drive) via Exit 20; the left three lanes continue south along the turnpike. Photo taken 05/06/06. 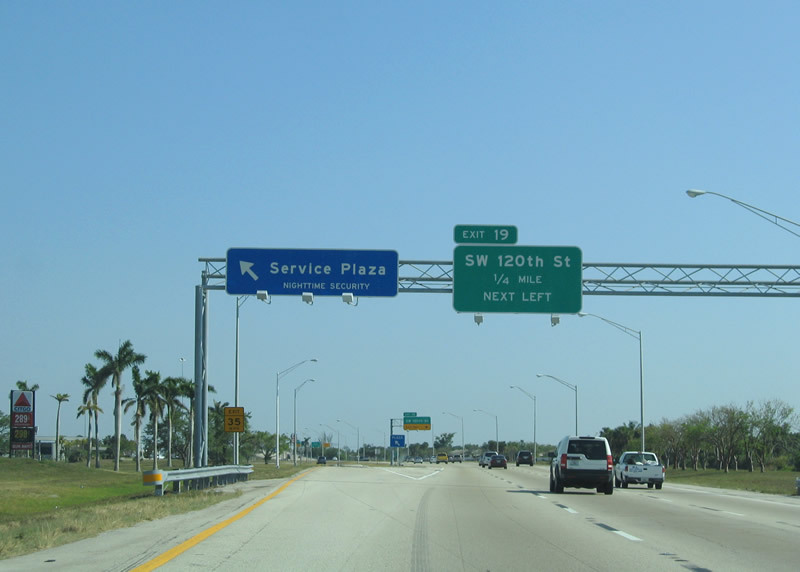 Southwest 104th Street passes over Florida's Turnpike ahead of the Snapper Creek Service Plaza. The facility provides food and fuel options and tourist information. Photo taken 05/06/06. An inverted diamond interchange joins Florida's Turnpike with Southwest 120th Street at the south end of the Snapper Creek Service Plaza. Access to the plaza is available from the Exit 19 ramps. Photo taken 05/06/06. Exit 19 leaves at the south end of the Snapper Creek Service Plaza. Southwest 120th Street stems west from parallel Southwest 117th Avenue to Florida 825 (Southwest 137th Avenue) Kendall-Tamiami Executive Airport (TMB). Photo taken 12/28/03. 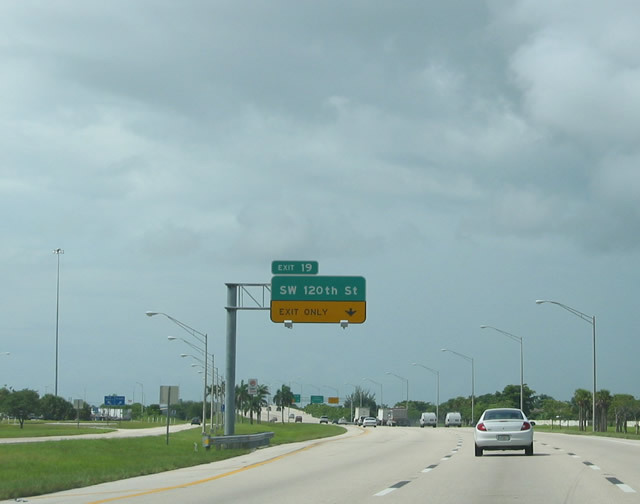 Southbound Florida's Turnpike reaches Exit 19, S.W. 120th Street. 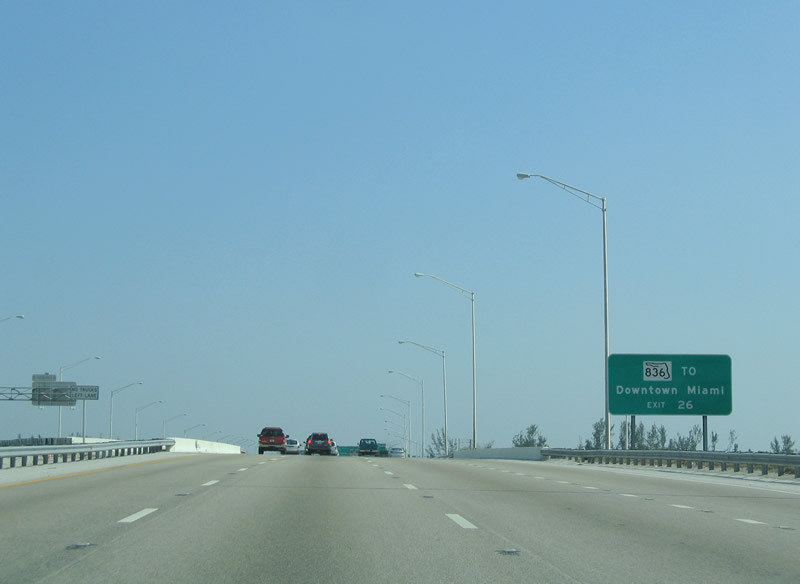 The right lane ends, so the turnpike only retains two lanes along southbound from here south to the end in Homestead/Florida City. Photo taken 12/28/03. The next interchange along southbound is for Exit 16, S.W. 117th Avenue to Florida 992, S.W. 152nd Street. Photo taken 12/28/03. 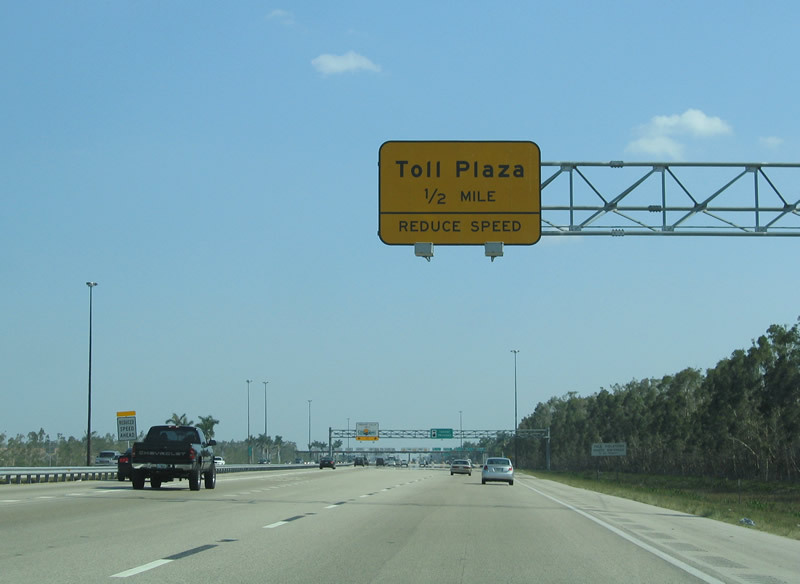 Florida 874 Toll (Don Shula [South Dade] Expressway) merges with Florida's Turnpike at a wye interchange (Exit 17 on northbound). 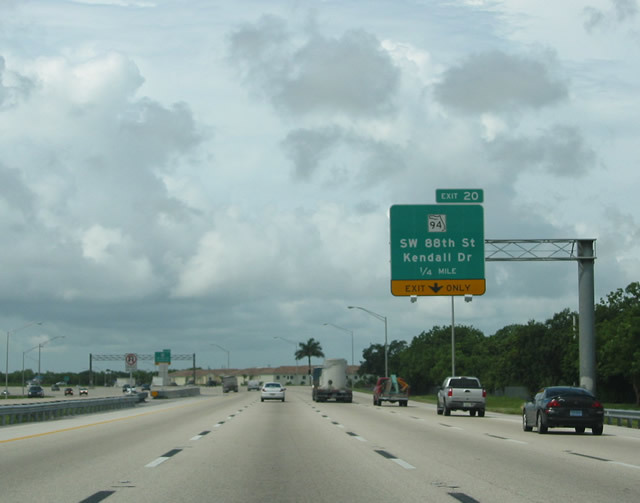 The Don Shula Expressway provides a direct connection from Florida 826 (Palmetto Expressway) and Florida 878 Toll (Snapper Creek Expressway) at Kendall and South Miami. Florida 878 Toll merges in from the left, complete with an end shield [pictured here]. Photo taken 05/06/06. 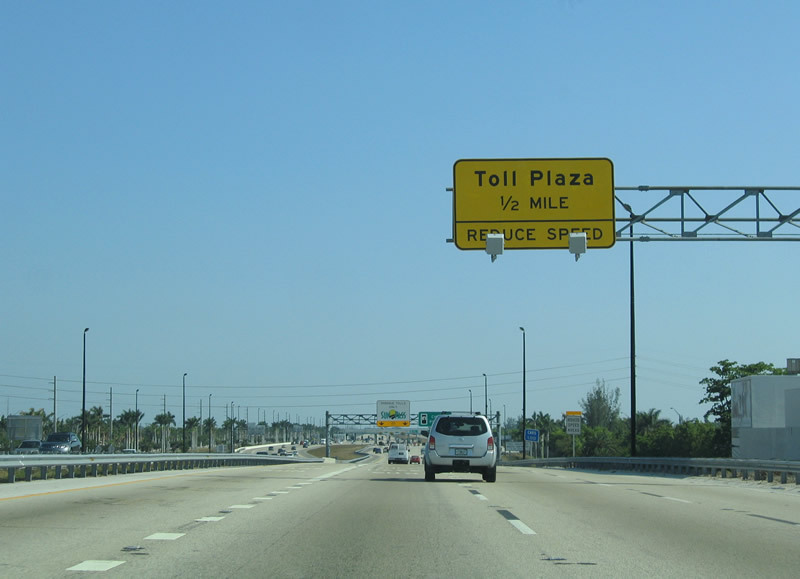 Florida's Turnpike southbound briefly carries five lanes between Florida 874 Toll (Don Shula Expressway) and the Exit 16 split-diamond interchange with Southwest 117th Street and Florida 992 (Southwest 152nd Street / Coral Reef Drive). Southwest 117th Street enters the scene from Westwood Lakes adjacent to the Turnpike. Photo taken 05/06/06. 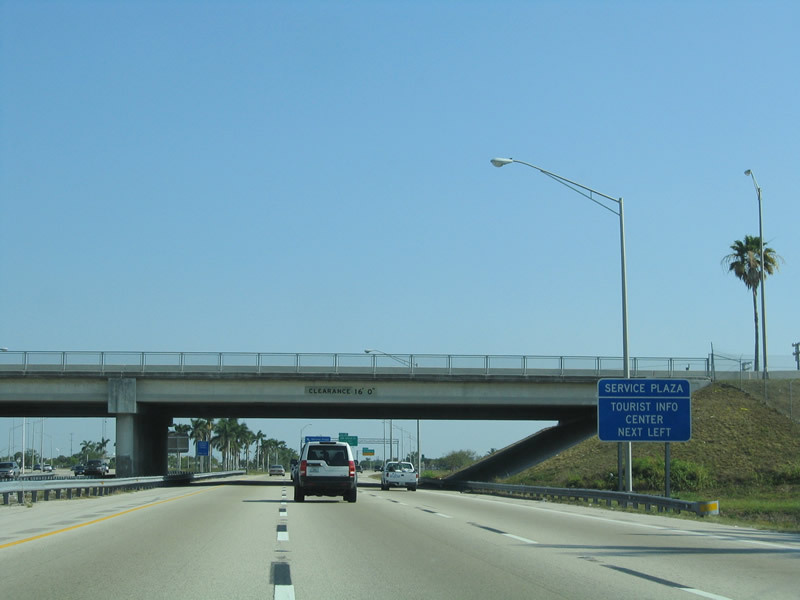 Exit 16 leaves Florida's Turnpike southbound at Richmond Heights. 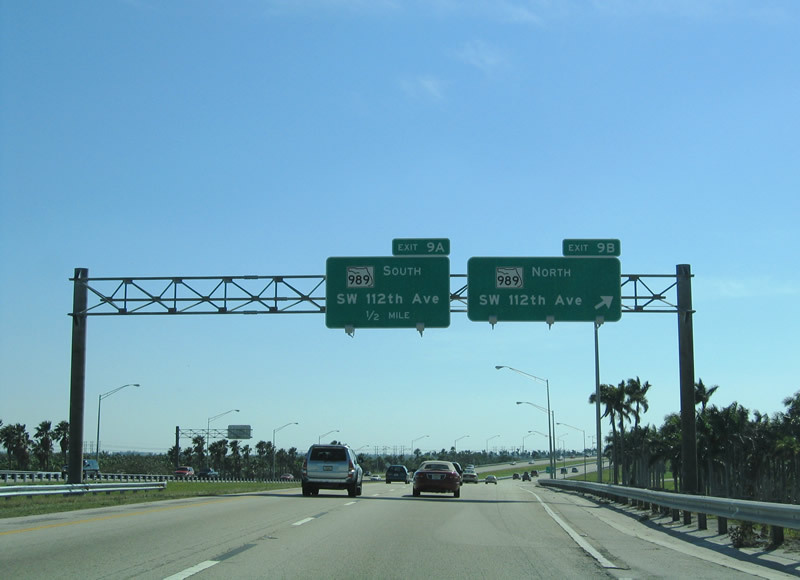 Florida 992 (Southwest 152nd Street) heads east to Rockdale and Deering Bay. Southwest 152nd Street (Coral Reef Drive) continues west to Richmond. Photo taken 05/06/06. A second split-diamond interchange joins Florida's Turnpike with both Eureka Drive / Southwest 184th Avenue and Florida 994 (Quail Roost Drive) at Exit 13. The interchange claims the fourth southbound lane. Photo taken 03/25/06. Florida's Turnpike southbound reassurance marker posted at the Richmond Drive under crossing at South Miami Heights. Photo taken 03/25/06. Southbound Florida's Turnpike at the Exit 13 ramp departure to Eureka Drive and Florida 994 (Quail Roost Road) at Cutler Ridge. Both roads head east to U.S. 1 (Dixie Highway). Westward, Southwest 184th Street continues to Larry & Penny Thompson Memorial Park and Lindgren Acres. Florida 994 meanwhile continues west along Quail Roost Drive / Southwest 200th Street to Florida 997 (Krome Avenue). Photo taken 05/06/06. 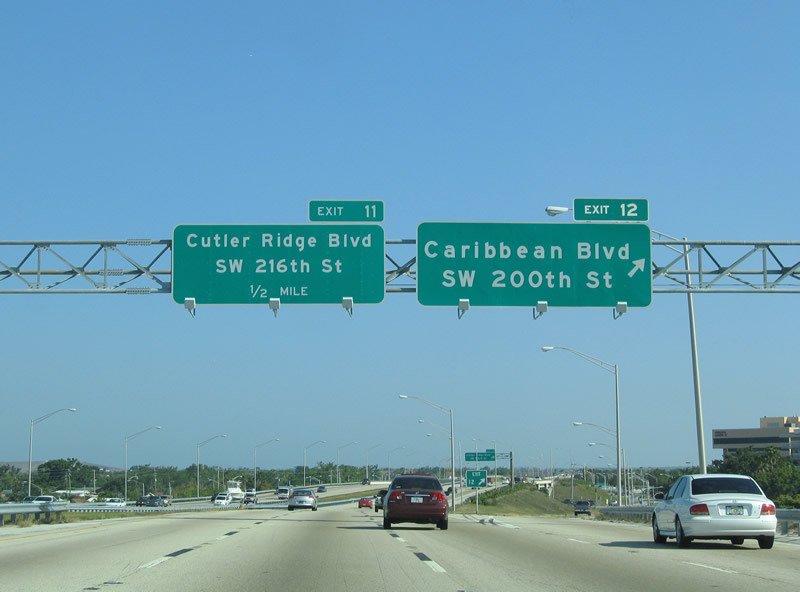 Exit 12 consists of a southbound only off-ramp to Caribbean Boulevard at Southland Mall (formerly Cutler Ridge Mall). Caribbean Boulevard arcs northwest to Southwest 200th Street at U.S. 1 (Dixie Highway) and northeast to Franjo Road in Cutler Ridge. Photo taken 05/06/06. Exit 11 quickly follows onto a southbound frontage road between Caribbean Boulevard and Southwest 211th Street / Cutler Ridge Boulevard. SW 211th Street encircles Southland Mall between Florida's Turnpike and U.S. 1 (Dixie Highway). The southbound Turnpike also reduces from three to two lanes here. Photo taken 03/25/06. Florida's turnpike passes over Southwest 216th Avenue at the south end of Exit 11, 1.25 miles north of the final main line toll plaza. Photo taken 05/06/06. 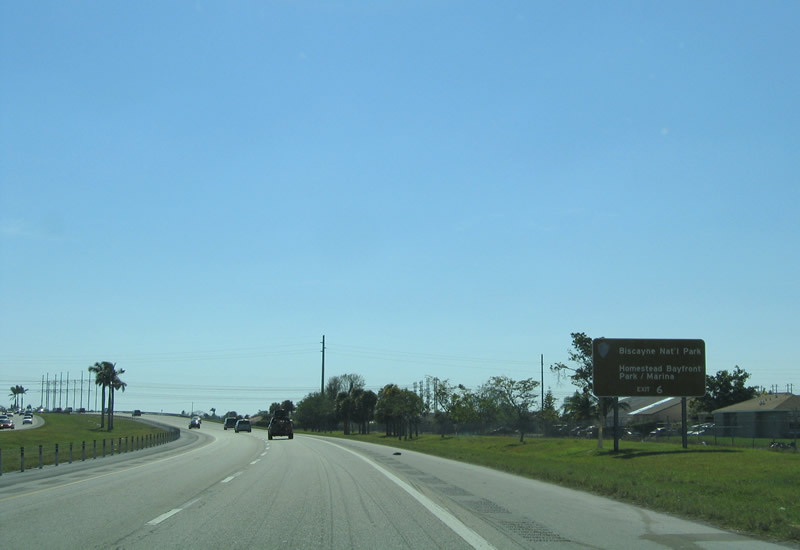 Florida's Turnpike shield posted ahead of the Exit 11 on-ramp from Southwest 216th Avenue near Cutler Ridge. Photo taken 03/25/06. Entering the last toll plaza on Florida's Turnpike southbound. 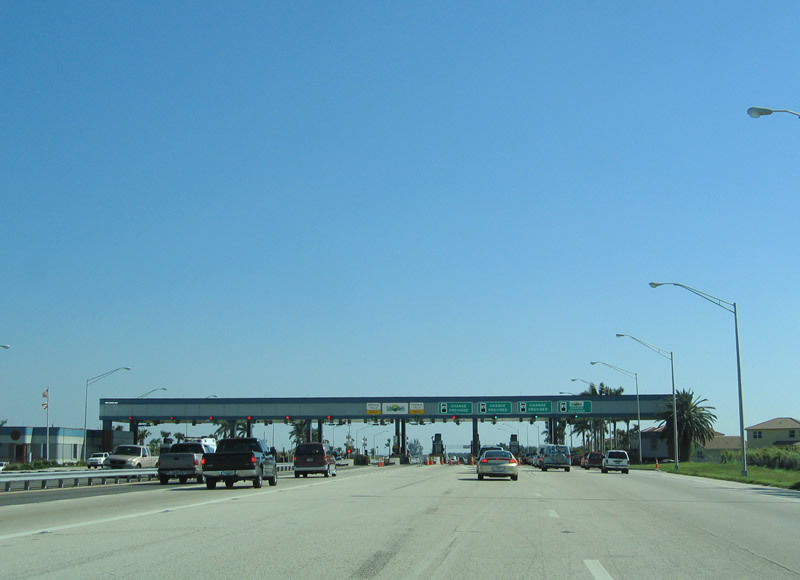 Again two SunPass only lanes are provided to the left, with four cash lanes to the right. Passenger vehicles are levied $1.00 tolls for cash transactions and 75 cent tolls for SunPass account holders. Photos taken 03/25/06 & 05/06/06. 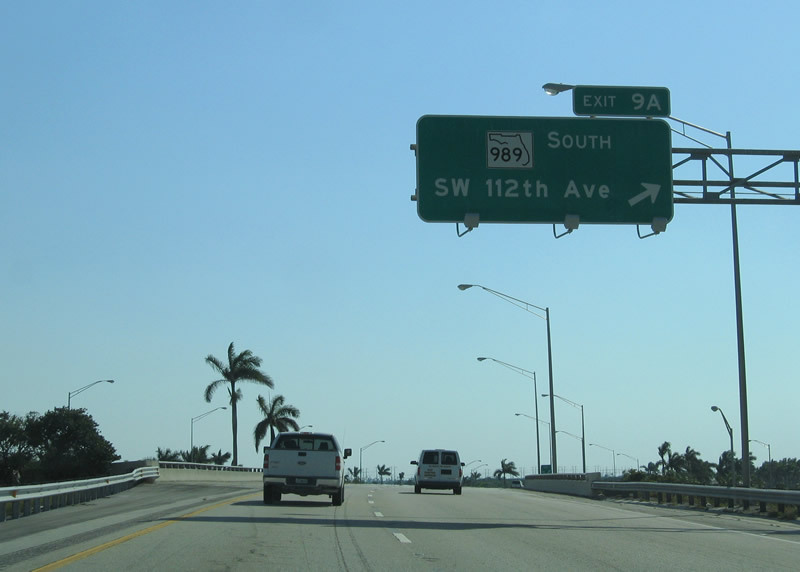 Continuing south, Florida's Turnpike next meets Florida 989 (Southwest 112th Avenue) at South Allapattah. 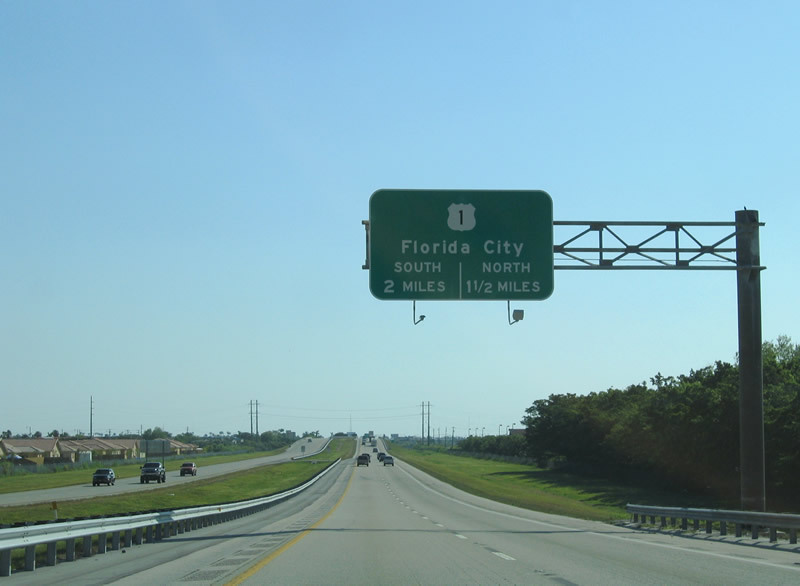 Florida 989 ventures south from U.S. 1 (Dixie Highway) and Cutler Ridge to Exit 9. Photo taken 05/06/06. 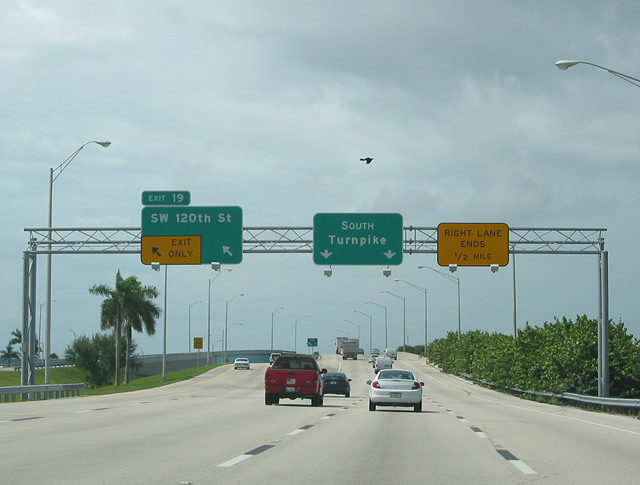 The final southbound mileage sign highlights the Turnpike destinations of Homestead and Florida City and Key West via U.S. 1 south. Photo taken 05/06/06. 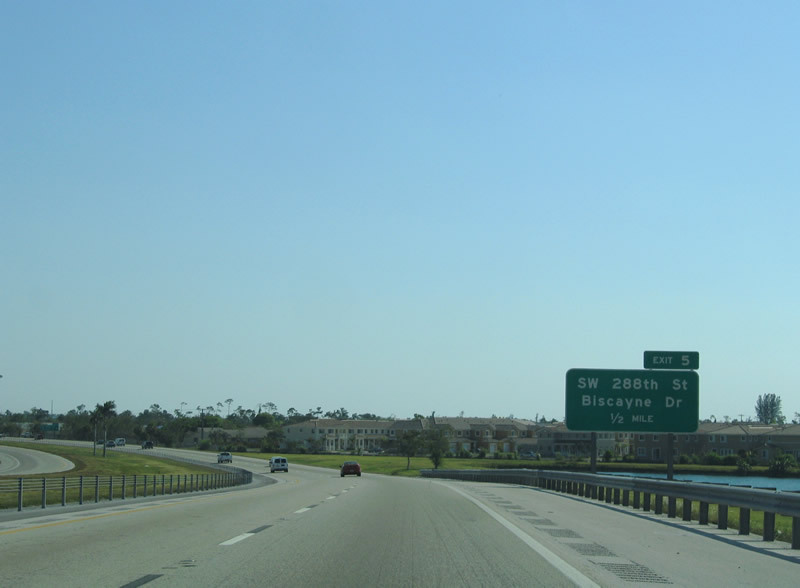 Exit 9B connects southbound Turnpike with northbound Florida 989/S.W. 112th Avenue north. Exit 9A, the second ramp, connects the turnpike with southbound S.W. 112th Avenue (signed here erroneously as Florida 989 south). 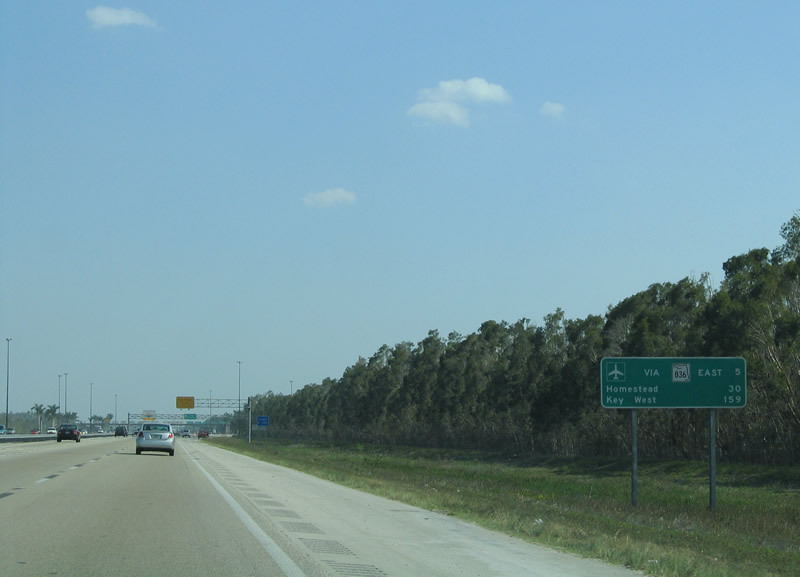 Florida 989 ends at this interchange and does not extend any further south along S.W. 112th Avenue. Photo taken 03/25/06. Southwest 112th Avenue continues south from South Allapattah (Exit 9A) through agricultural lands to Homestead Air Reserve base. Photo taken 03/25/06. The next exit along southbound is Exit 6, S.W. 137th Avenue and Speedway Boulevard, one mile. 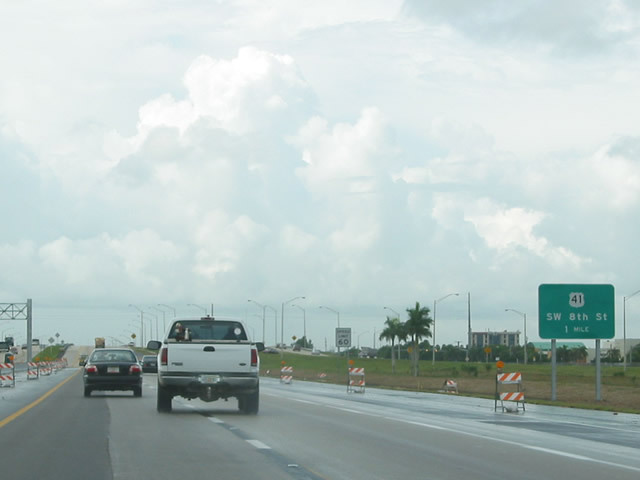 For traffic exiting here, there is no direct reentry back onto southbound Florida's Turnpike. Photo taken 05/06/06. Southwest 137th Avenue leads south to North Canal Drive (Southwest 328th Street), a road that leads east to Biscayne Bay. Biscayne National Park and Homestead Bayfront Park & Marina lie along the bay at the end of North Canal Drive. Photo taken 03/25/06. Florida's Turnpike passes over Southwest 268th Street at Pine Island Lake Park, one half mile north of the Exit 6 off-ramp to Southwest 137th Avenue. Interests to Homestead Air Reserve Base are advised to take Southwest 137th Street south to Bougainville Boulevard east. Photo taken 03/25/06. 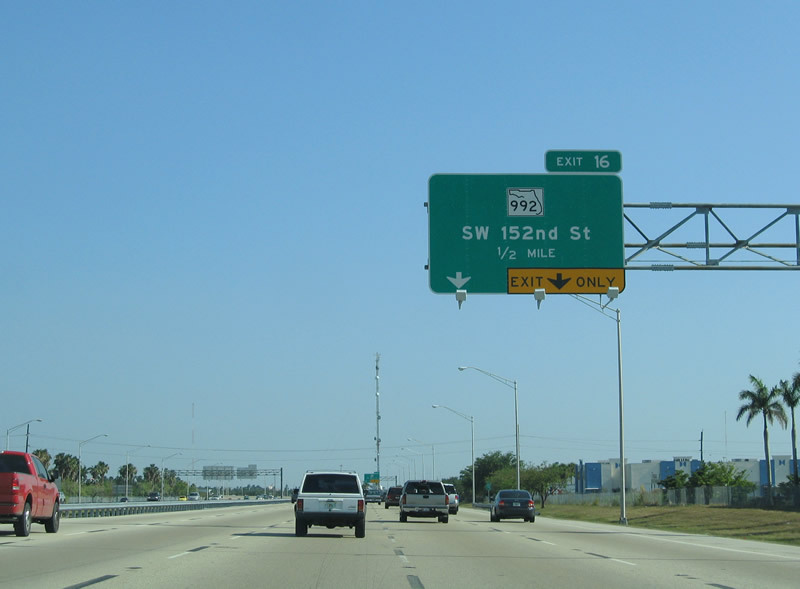 Drivers bound for Southwest 137th Avenue part ways with Florida's Turnpike via Exit 6. 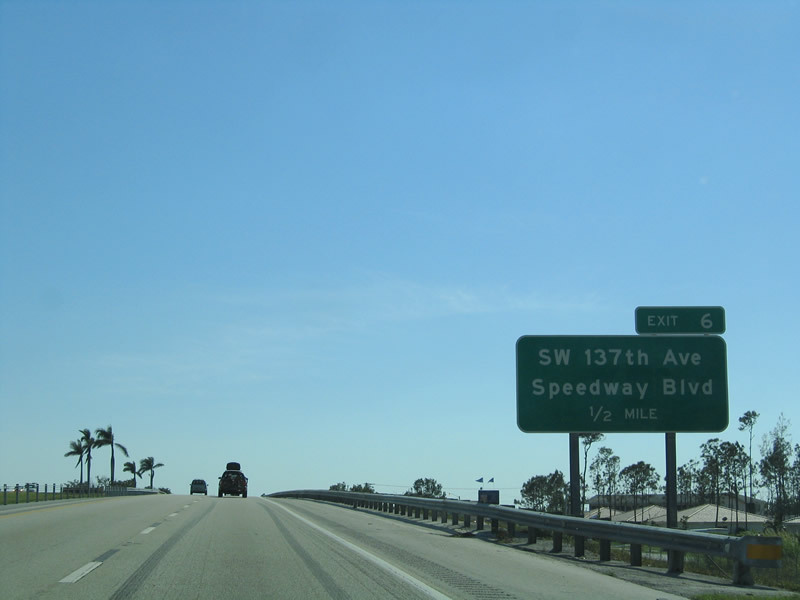 Southwest 137th Avenue leads north to U.S. 1 (Dixie Highway) and south to Homestead Miami Speedway at Southwest 344th Street. Photo taken 03/25/06. The next exit along southbound is Exit 5, S.W. 288th Street/Biscayne Drive. 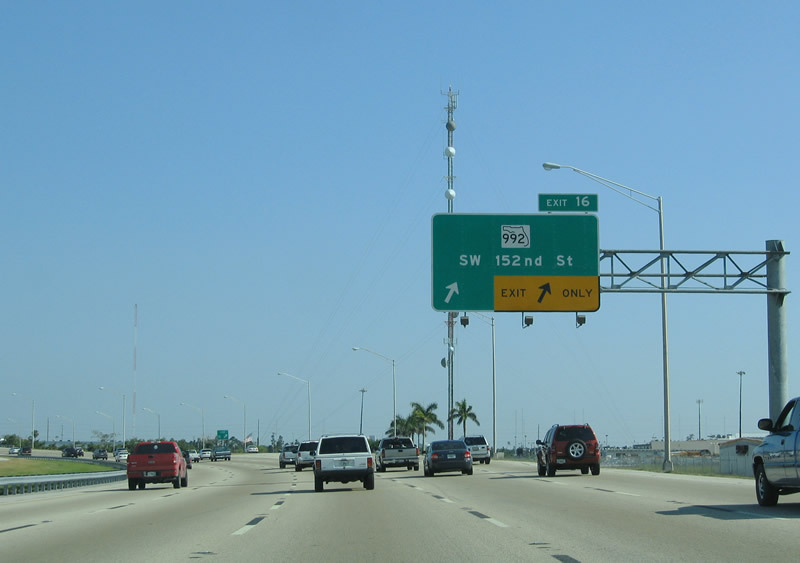 Southwest 288th Street heads west from Florida's Turnpike to Leisure City north of Homestead. Photo taken 03/25/06. 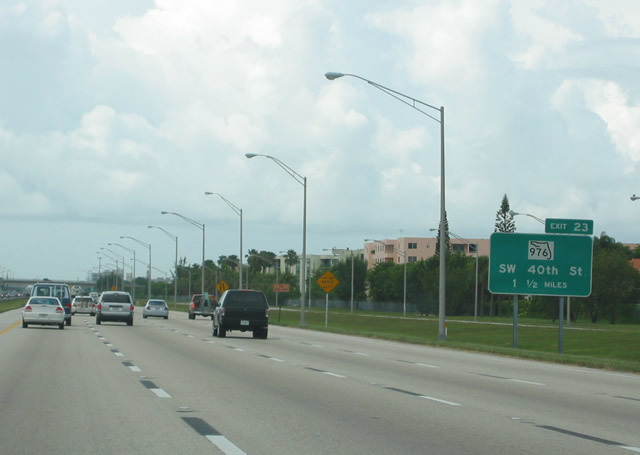 Southbound Florida's Turnpike at the Exit 5 parclo interchange with Southwest 288th Street / Biscayne Drive. Eastward, Southwest 288th Street becomes Bougainville Boulevard into Homestead Air Reserve Base. Photo taken 05/06/06. 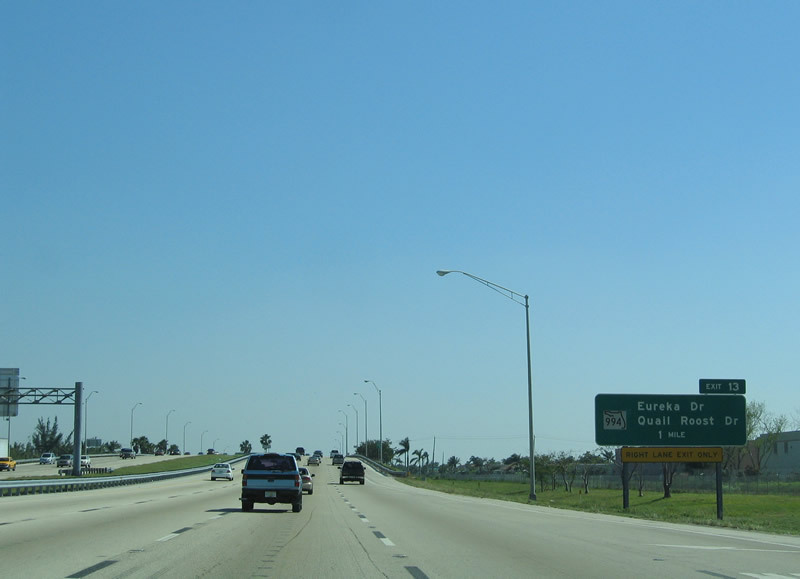 Approaching the city of Homestead, the penultimate exit along southbound Florida's Turnpike is Exit 2, Campbell Drive. A folded-diamond interchange joins the two roads near sprawling development north of Mowry Canal. Photo taken 05/06/06. One half mile north of the Exit 2 off-ramp to Campbell Drive. 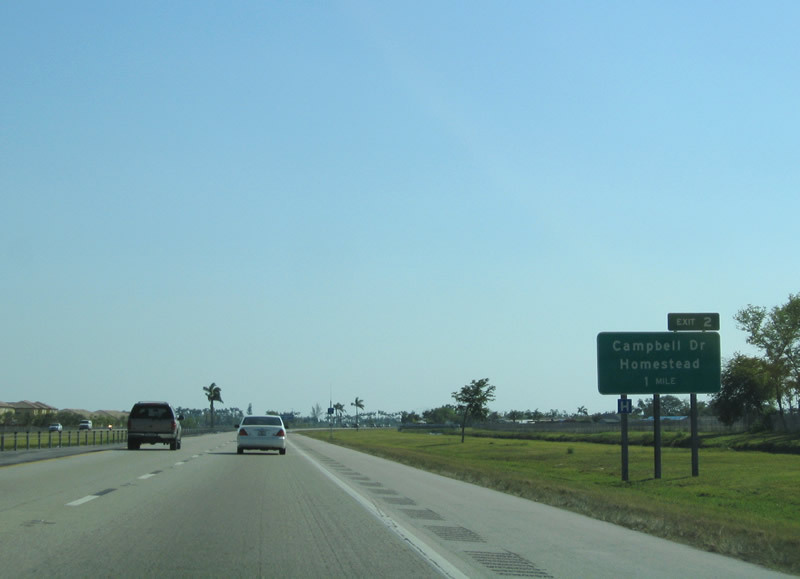 Campbell Drive (Southwest 312th Street) heads west from the Homestead Air Reserve Base area to U.S. 1 (Dixie Highway) and Florida 997 (Krome Avenue) in central Homestead. Photo taken 03/25/06. 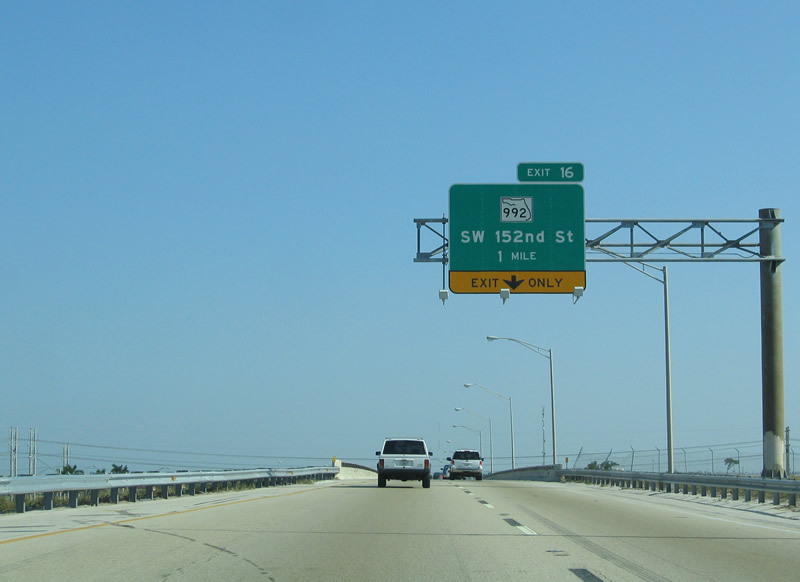 This mileage sign provides the distance to Key West via U.S. 1, the Overseas Highway, from here, only two miles north of the southern terminus of Florida's Turnpike. Photo taken 05/06/06. The final exit along southbound Florida's Turnpike is at U.S. 1. 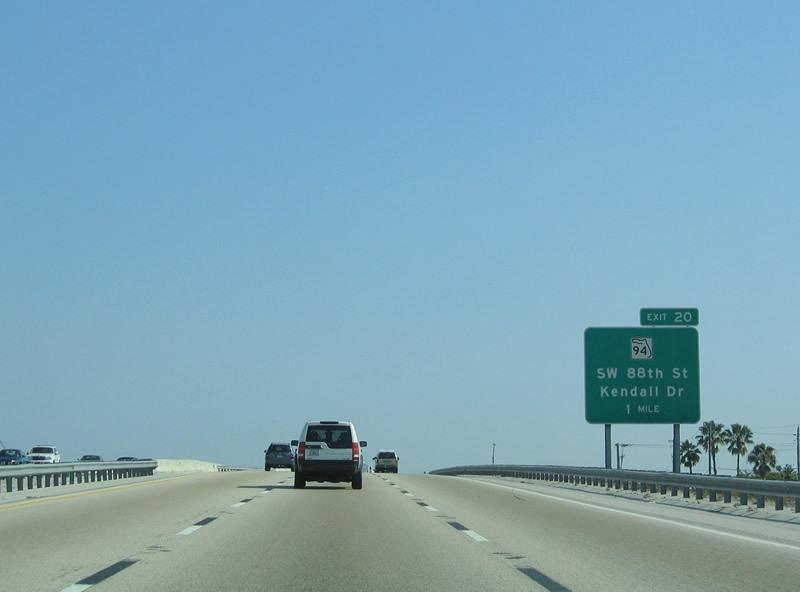 U.S. 1 continues south as one of only two routes to Key Largo and the Florida Keys. 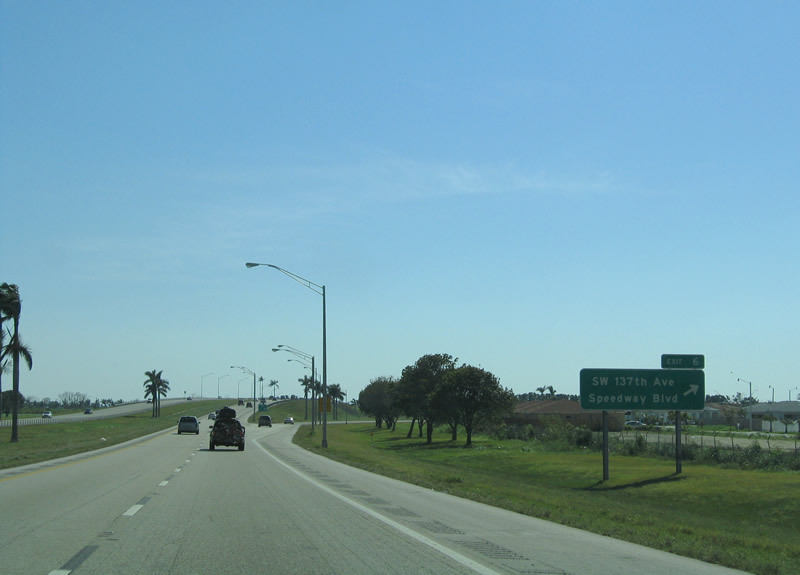 The other route, Card Sound Route, is accessible via U.S. 1 south of Florida City. Photo taken 05/06/06. Drawing to within one mile of Florida's Turnpike southern terminus. Return access to U.S. 1 northbound toward Homestead is available at the last mainline off-ramp. Photo taken 05/06/06. 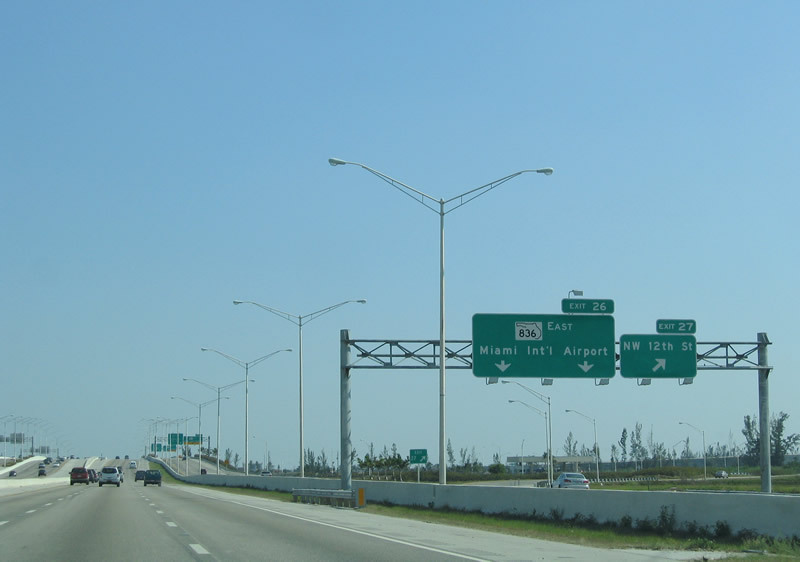 The freeway ends as the left two lanes prepare to transition directly onto southbound U.S. 1, while the right lane offers an exit onto northbound U.S. 1. Photo taken 05/06/06. 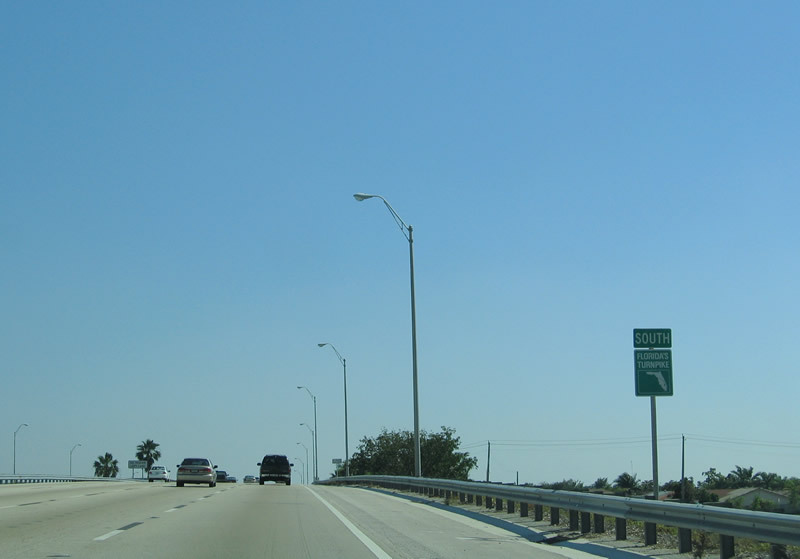 Exit 1 leaves Florida's Turnpike south for U.S. 1 (South Dixie Highway) north. This is the furthest south that any freeway travels in the state of Florida, and possibly in the contiguous United States. 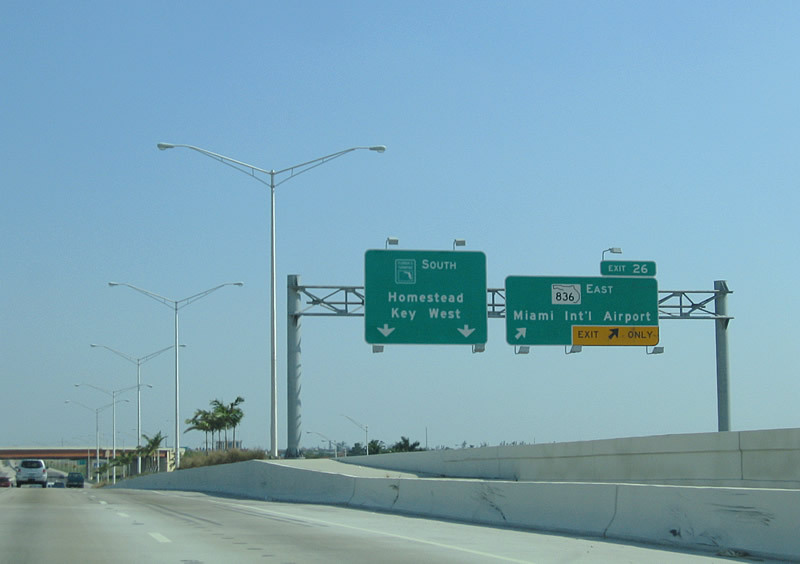 Southbound Florida's Turnpike ends here in Homestead/Florida City. Photo taken 12/28/03. 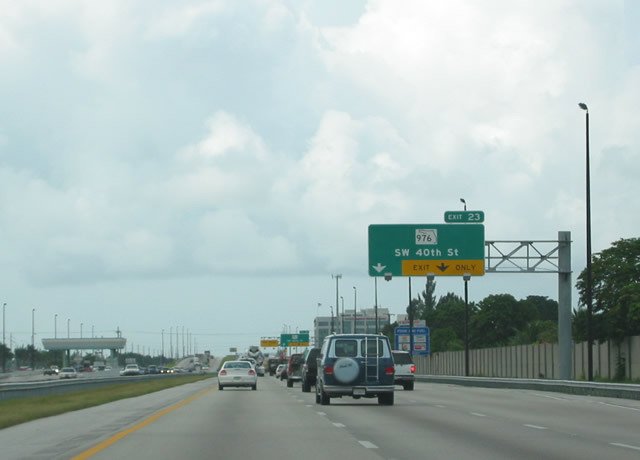 Drivers remaining on Florida's Turnpike south to U.S. 1 (South Dixie Highway) south squeeze into one lane before merging onto the U.S. highway from the right. Photo taken 05/06/06. 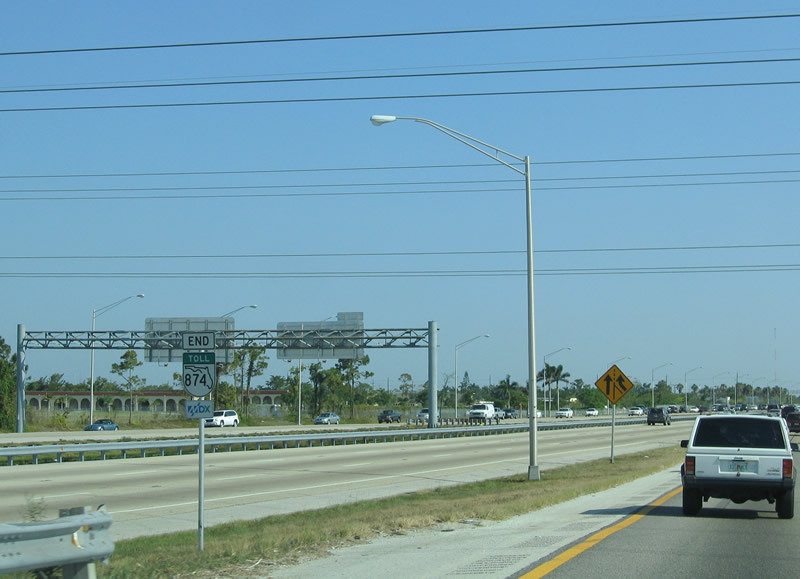 End Florida's Turnpike shield assembly posted at U.S. 1 (South Dixie Highway) southbound ahead of its intersection with Florida 9336 (Palm Drive) in Florida City. Similar end turnpike system signs are found on Turnpike segments in the Orlando and Tampa areas. Photo taken 03/25/06. Page Updated April 28, 2008.